ERIKA - IS NO LONGER A TROPICAL SYSTEM - No impact to Long Island As of Now - It looks like the heavy rain will go north to North Carolina and then OUT TO SEA!!!! the meteorological service of Cuba. 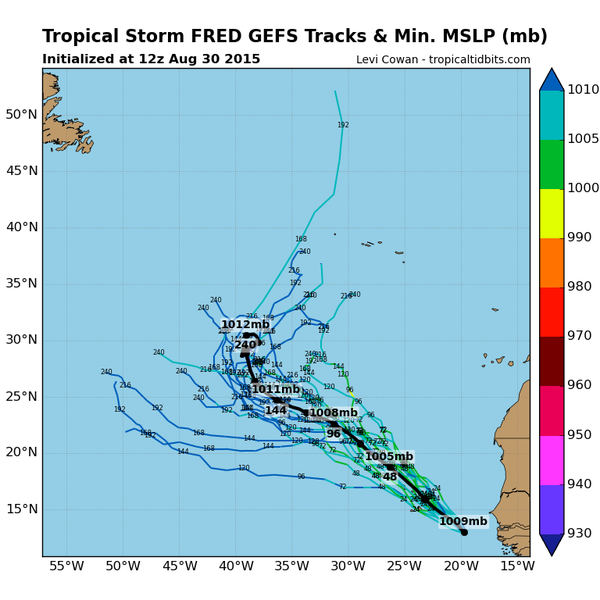 TROPICAL STORM FRED - NO THREAT TO THE UNITED STATES AT THIS TIME. It will feel more like the 1st week of July instead of the 1st week of September. Temperatures will be well above normal. Much better Beach weather than heading back to work and the classrooms. You will also notice the dry weather trend will continue through Labor Day Weekend. UV Index through the week will be HIGH. Water Temperatures will be in the 70s. Heights 3 to 4 feet. 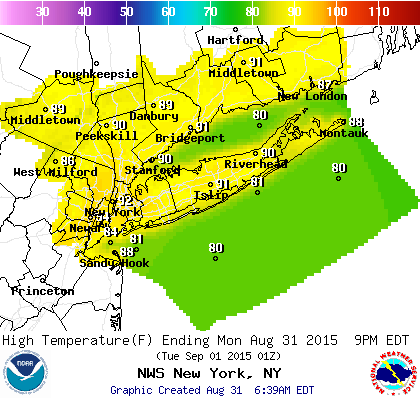 Below map shows highs around Long Island, you can see 80s to low 90s. Partly Cloudy, warm and muggy. Winds West-Northwest 5 to 10 mph. Lows near 69.
mph. Record High is 93 set in 2010. The below map shows the hot weather Continues on Tuesday. TOMORROW NIGHT: Partly cloudy. Lows 67 to 72. Sun and Clouds. Warm/Hot. Highs 85 to 90. The below map shows the high temperatures on September 2nd. Notice the 80s and 90s. Yes parts of Nassau County could have a heat wave( 3 days in a row of 90 or higher) this week. 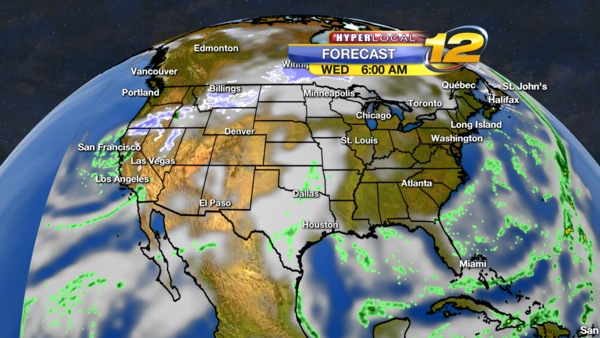 Below map for Wednesday - Red line in New England is a warm front - It will keep the hot weather around Long Island. WEDNESDAY NIGHT: Partly Cloudy. Lows near 70. THURSDAY NIGHT: Partly Cloudy and muggy. Lows in the low 70s. Partly sunny. Highs near 84. Lows near 66. Morning clouds giving way to more sun. Highs near 83. Lows near 68. Here is weather map for 8am on Monday September 7th - Labor Day. If the forecast holds. 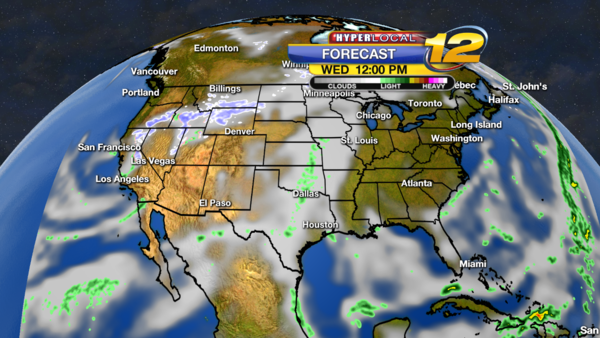 The map shows High Pressure in Control of our weather. Expect sunshine with highs in the 80s. Heading to the beach? A great holiday forecast! If you'll be at the beach or on the water today, a moderate rip current risk and a high UV INDEX = 20-30 min sunburn time - otherwise, no advisories. 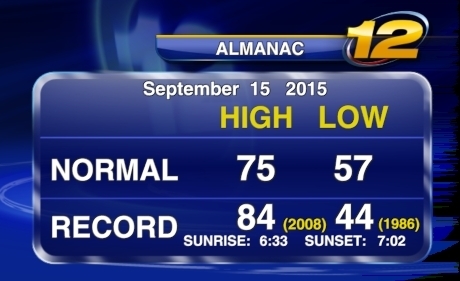 We have just over 15 days left of summer, so there is still plenty of Long Island weather to enjoy. However, we REALLY do need rain as we are in a moderate drought. Towards next weekend we get to more seasonable temperatures with highs in the upper 70's. A nice, very warm day. 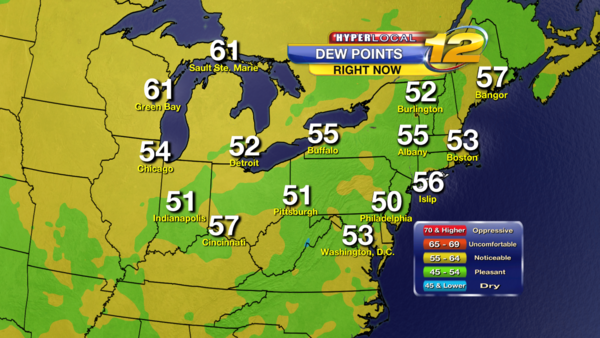 Slightly more humid. Mainly sunny. Hot and Humid. Highs near 88. Winds S 10-15 mph. WEDNESDAY Chance for a few showers, as early as the morning hours (see current futurecast projection below) Highs near 85. Lows near 70. 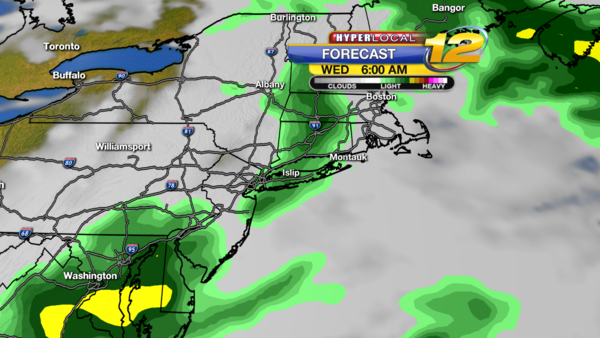 An increasing chance for some much needed wet weather comes overnight Wednesday into Thursday. Scattered showers. Chance for a thunderstorm. Highs near 84. Lows near 68. Mostly cloudy. Highs near 82. Lows near 66. Mostly sunny. Chance of a thunderstorm. Highs near 78. Lows near 56. Partly sunny. Highs near 78. Lows near 58. Quick Tropic Check: No current threat to the US or Long Island with Tropical Storm Grace, but you can see the current projected track below. The storm is expected to encounter some weakening, same as the prior few storms and will be approaching the Caribbean towards next weekend. I hope you all have a great Labor Day and a great rest of the week! 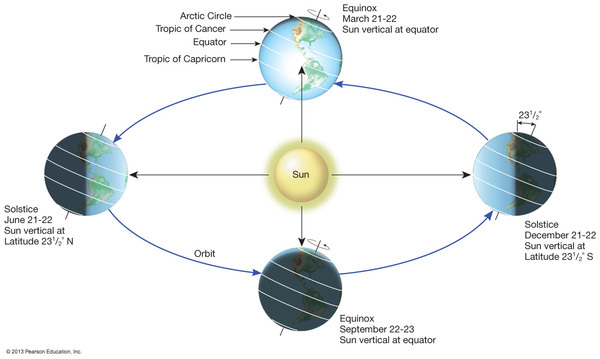 EQUINOX------September 23, 4:21 A.M. EDT. Possible Record high today as temperatures will soar into the 80s. High at Islip (KISP) is 89 set in 1996. Normal Average High is 77. Sunset: 7:12pm. TONIGHT: A stray shower or storm. Mostly cloudy skies. Warm and Muggy. Lows 70 to 75. Sunrise: 6:29am. Normal Average Low is 59. TOMORROW: Mostly Cloudy skies. Scattered showers and thunderstorms developing. 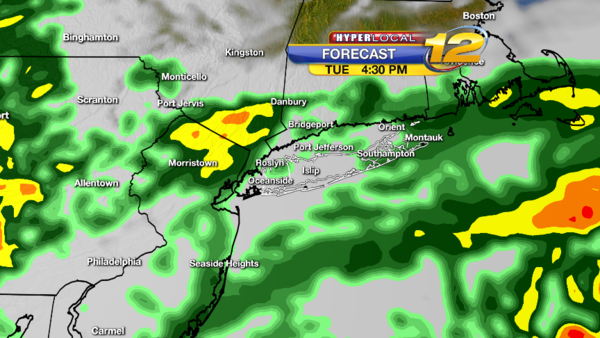 Best threat for rain will be in the afternoon into the evening. Some heavy flooding rain possible. Highs near 80.
flooding rain possible. Rain totals could be 1 to 2 inches. Lows 65 to 70. 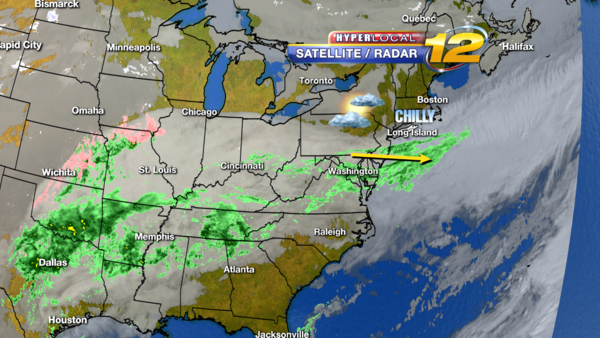 WEATHER MAP FOR 8PM THURSDAY shows cold front passing Long Island. afternoon. Highs 75 to 80. FRIDAY NIGHT: Partly Cloudy. Lows 60 to 65. SATURDAY: Sun and Clouds. Highs 75 to 80. 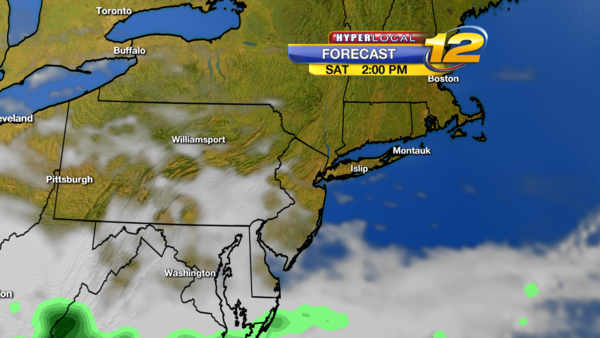 Weather Map for Saturday - Low pressure South and East of Long Island - Far enough away that the day will stay dry. SUNDAY: Mostly cloudy. Chance of a Shower or thunderstorm. Highs near 76. 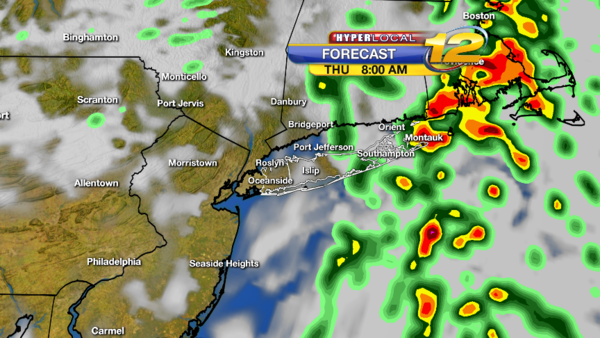 Suffolk County Marathon Weather: Mostly Cloudy threat for showers and storms. 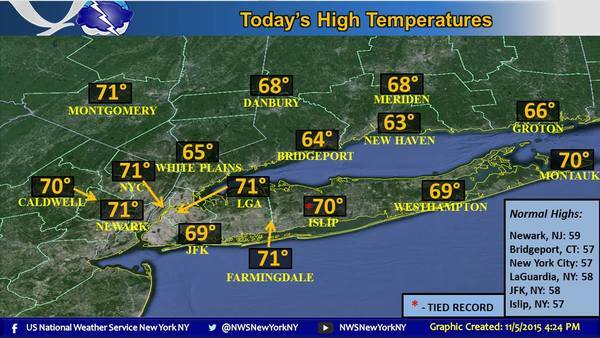 7-9am Temperatures 65 to 70. 11am to 2pm Mostly Cloudy threat of showers and thunderstorm. Temperatures 73 to 78. 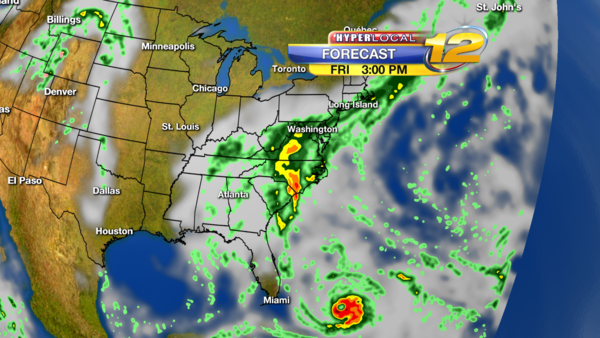 Low Pressure Near Long Island will bring threat of Rain. SUNDAY NIGHT: Mostly Cloudy with some scattered showers and storms. Lows near 63. 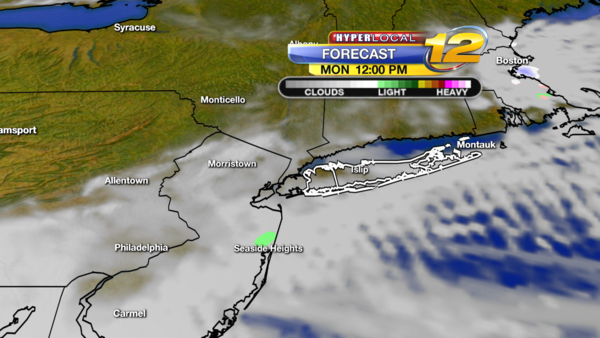 MONDAY: A mix of sun and clouds. Highs near 75. Lows near 60. TUESDAY: Mostly sunny skies. Highs near 77. Lows near 62. 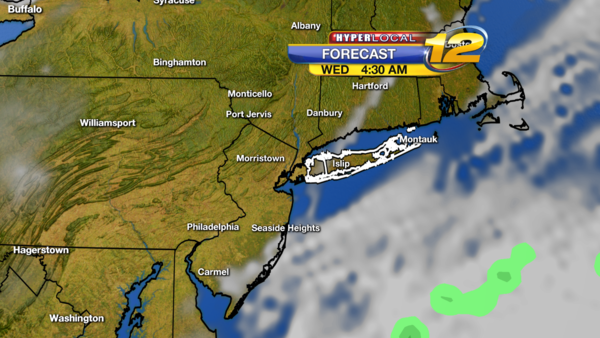 Plenty of nice, dry weather is in place across Long Island and up and down the east coast. A great shot in Long Beach. The weather will look this nice throughout the rest of the week! Are you enjoying all of this sunshine? Well, then get ready to enjoy much of the next seven days. We are really locked into a nice weather pattern right now. 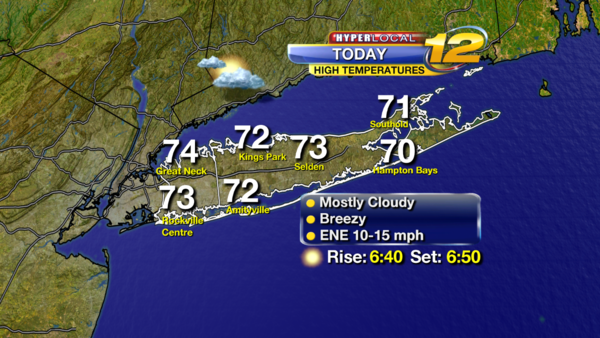 Another mostly sunny and comfortably warm day. 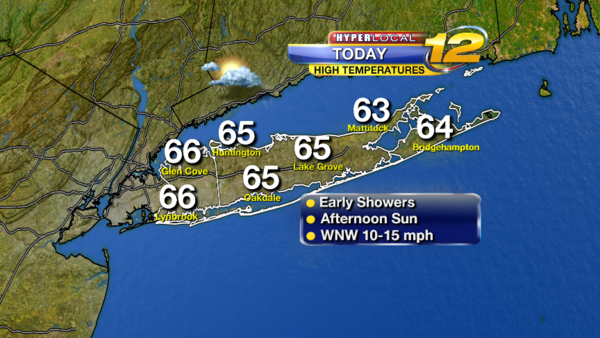 Highs around 80 degrees this afternoon. See below and notice that our high of near 80 today is actually five degrees above the average of 75 degrees for this time of the year. Winds today WNW-SW 5-10 mph. 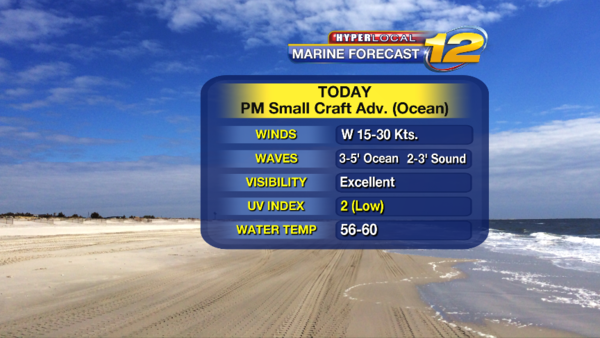 BOATERS: No Advisories today on the ocean or LI Sound. UV Index = HIGH across the island. Clear and cool overnight. Lows near 59. 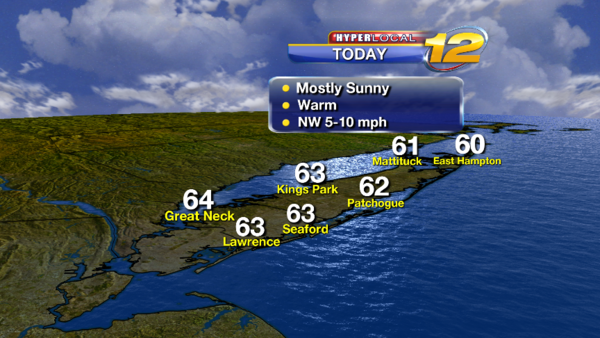 Coolest spots towards the Pine Barrens (low 50s) - Warmest spots in Nassau (low 60s). Winds WNW around 5 mph. 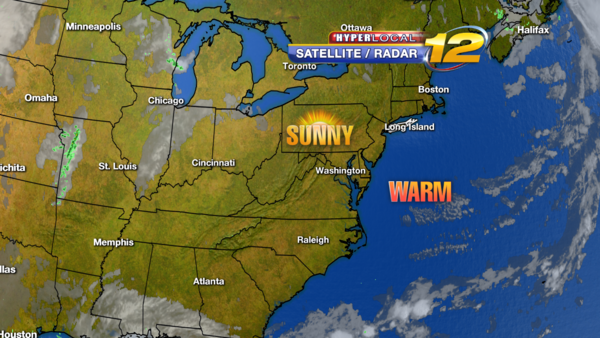 Another mostly sunny and warm day as this nice, dry weather pattern continues. Slightly warmer than today. Highs around 82. Winds N-S 5-10 mph. Mostly sunny skies. Highs near 83. Lows near 63. Mostly sunny skies. Highs near 84. Lows near 65. Broken-record forecast continues...Great weather. Mostly sunny skies. Highs near 81. Lows near 64. We finally start to notice a few changes. Becoming mainly cloudy. An approaching, weakening front will bring the chance of a shower. Highs near 77. Overnight lows near 58. Partly sunny and breezy. Highs near 74. Lows near 56. Lots of clouds of this last full day of the Summer of 2015. 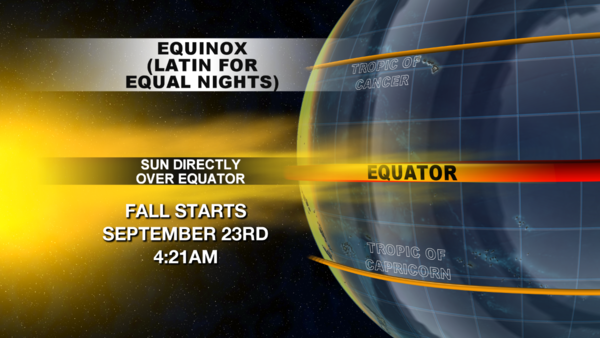 The Fall Equinox starts at 4:21am September 23rd. 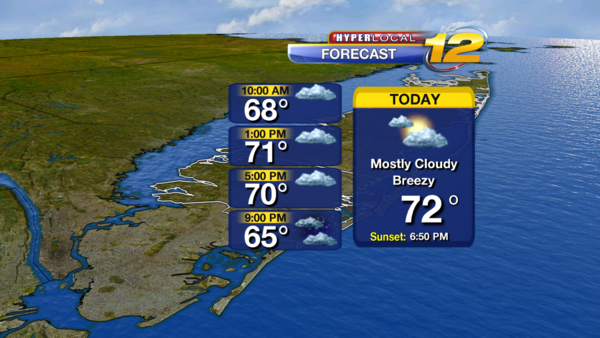 Mostly Cloudy skies and it will be breezy. Highs in the lower 70s. 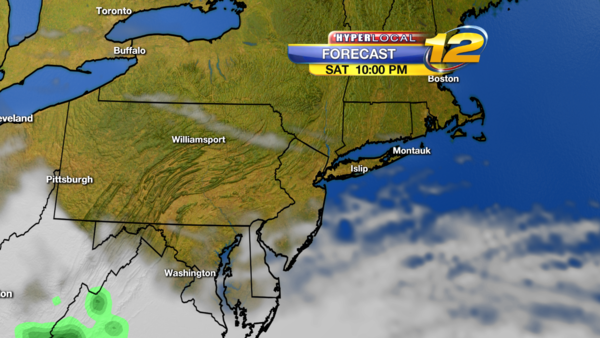 Clouds will give way to clear skies overnight with lows 53 to 60 degrees. 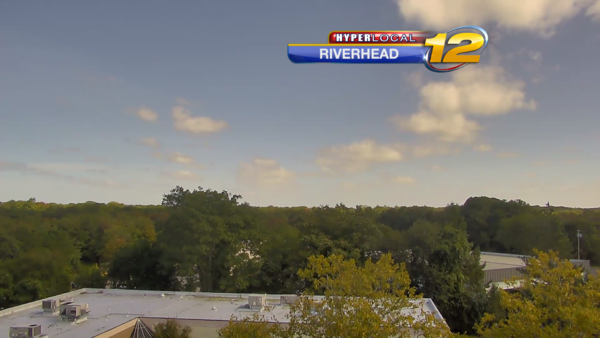 Mostly Sunny skies for the 1st afternoon of Fall. Highs 75 to 80. 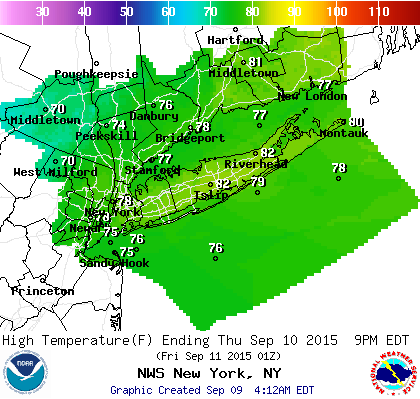 Mostly Sunny Skies on Thursday with highs 75 to 80. The Supermoon and Eclipse is Sunday night starting at 9:07pm E.D.T and will end at 10:11pm E.D.T . * The Moon is above the horizon during this eclipse, so with good weather conditions in New York, the entire eclipse is visible. The magnitude of the eclipse is 1.276. Total duration of the eclipse is 5 hours, 11 minutes. 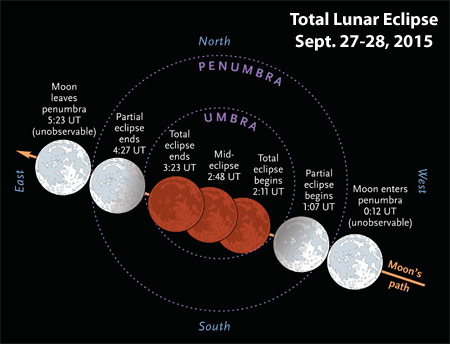 Total duration of the partial phases is 2 hours, 8 minutes. Duration of the full eclipse is 1 hour, 12 minutes. 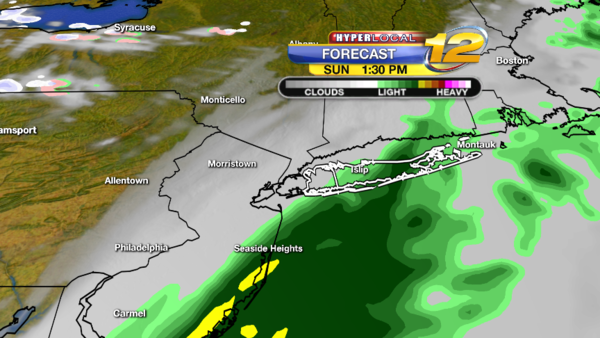 I will be tracking a coastal storm that could bring clouds and gusty winds Sunday into Monday. if you live along the water pay extra attention to the tides as they will be higher than normal because of the moon and because of the larger waves from coastal storm. TODAY: Sun and Clouds to partly sunny. Breezy. Winds East-Northeast 10 to 15 mph. Highs near 73. Sunset: 6:45pm. Normal Average high is 72. High risk for Rip Currents. Waves 4 to 6 feet. Water Temperatures 67 to 72. TONIGHT: Partly Cloudy. Cool. Winds East-Northeast 5 to 10 mph. Lows near 56. Sunrise: 6:44am. SATURDAY: Mostly Sunny to Sun and Clouds. Windy. Winds East-Northeast 10 to 20 gusts to 25mph. 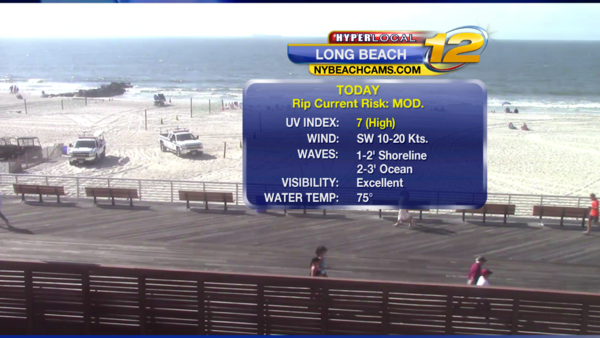 Highs near 70.High risk for Rip Currents. Waves 4 to 6 feet. Water Temperatures 67 to 72. BE ALERT AND TRACK HIGH TIDE TIMES THROUGH TUESDAY - Prolonged East-Northeast winds 10 to 25 mph will produce large swells on the south shore and east end. The Larger waves and tides running above normal because of the Full Moon we could have minor coastal flooding during times of high tide. SATURDAY NIGHT: Partly to mostly cloudy with lows 56 to 62. Be aware of high tides, some minor coastal flooding is possible. SUNDAY: Mostly Cloudy, with breaks of sunshine. Windy. Winds East-Northeast 10 to 20 gusts to 25mph. Highs near 72. Be aware of high tides, some minor coastal flooding is possible. ECLIPSE Weather: Eclipse starts at 9:07pm, Full Eclipse at 10:11pm, Eclipse ends at 12:27am, (Eclipse weather: partly to mostly cloudy, slight chance of shower, temperatures in the mid 60s.). 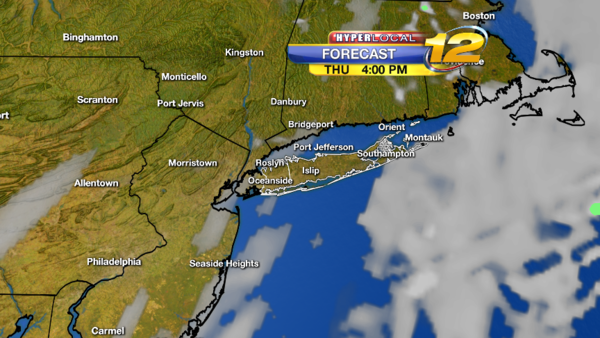 Clouds Near Long Island and we may be able to squeeze out breaks in the clouds - you have to keep keeping out the sky every few minutes. SUNDAY NIGHT: Mostly cloudy with a chance of showers. Lows 56 to 62. Be aware of high tides, some minor coastal flooding is possible. MONDAY: Mostly Cloudy. Chance of showers. Windy. Winds East-Northeast 10 to 20 gusts to 25mph. Highs near 75. Be aware of high tides, some minor coastal flooding is possible. MONDAY NIGHT: Mostly cloudy, slight chance of shower. Lows around 60. Be aware of high tides, some minor coastal flooding is possible. 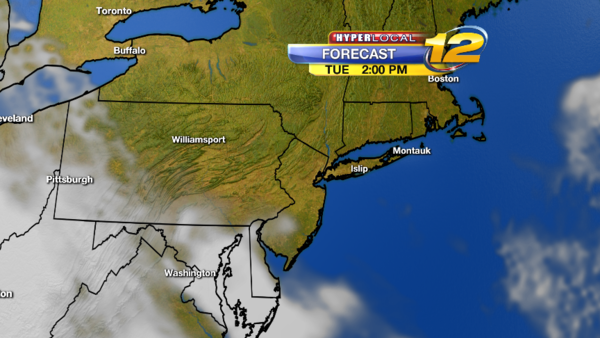 TUESDAY: Partly Sunny to Mostly Cloudy, small chance of a shower. Breezy. Highs near 76. Overnight will be partly cloudy with lows near 62.
turn toward the west-northwest is expected over the next day or two. Below is the most recent forecast for the storm. There is still a great deal of uncertainty with its' track and strength but this forecast puts the storm east of Delaware and due south of LI with 50 mph winds Saturday afternoon. What we know. 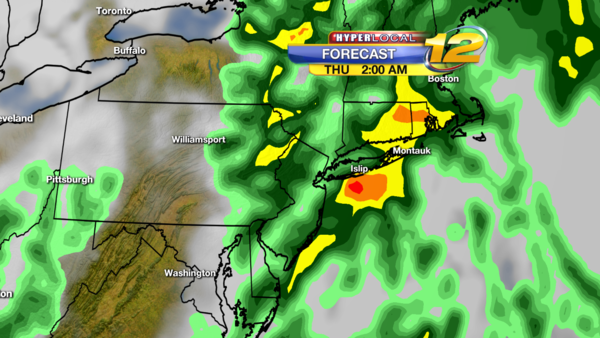 A cold front will approach Long Island overnight and warm tropical moisture will fall on Long island. 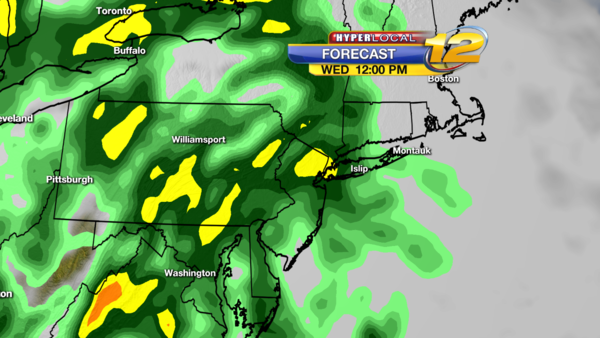 The heaviest rain will fall from 10pm to 10am with showers through Wednesday Afternoon. 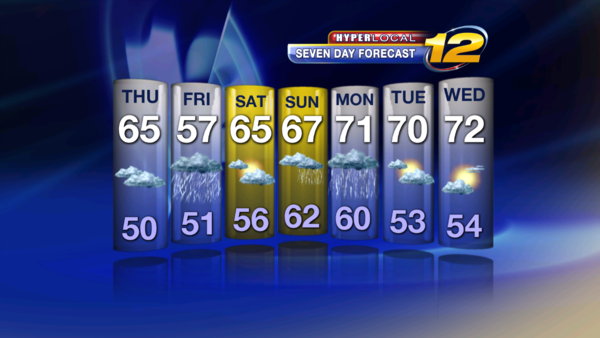 We will also see another period of rain Thursday afternoon into Friday. Now, onto Tropical Storm Joaquin - The track and intensity will change over the next 4 days - For Long island the biggest threat will be coastal flooding. How high will the waves become and how long will we have an easterly wind? TONIGHT: Cloudy skies. Showers and thunderstorms developing towards 10pm. Some heavy rain will lead to flooding. 1 to 2 inches of rain possible. Breezy at times. South-Southeast 10 to 15 mph. Lows near 68. TOMORROW: Cloudy skies. 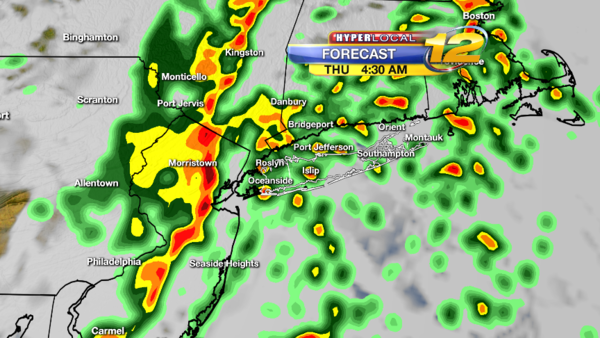 Showers and thunderstorms with some heavy rain in the morning. Some flooding. Some scattered showers for the afternoon. Windy. Winds North 10 to 20 gusts to 30 mph. 1 to 2 inches of rain possible. Storm totals 2 to 4 inches. Temperatures 70 to 75 in the morning, temperatures 65 to 70 in the afternoon. TOMORROW NIGHT: Mostly cloudy. A few showers. Windy. 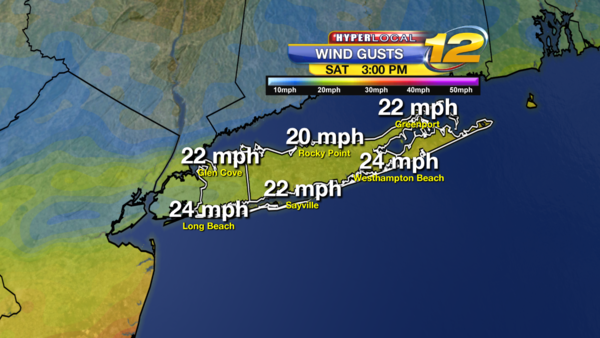 Winds North-Northeast 20 to 30 with gusts to 40 mph. Lows 55 to 60.THURSDAY: Mostly Cloudy skies. Scattered showers. Breezy. North-Northeast 15 to 25 mph. Highs 60 to 65. THURSDAY NIGHT: Mostly cloudy. Some scattered showers. Breezy. Chilly. Lows 50 to 55. FRIDAY: Mostly Cloudy skies. Threat for moderate to heavy rain. Breezy. North-Northeast 10 to 20 mph. Highs 60 to 65. Overnight will be mostly cloudy. Chance of showers. Breezy. Chilly. Lows 52 to 57. The track and strength of the storm is very important - A prolong easterly wind will allow waves to build and tides to rise through the weekend. This can lead to minor or moderate coastal flooding. 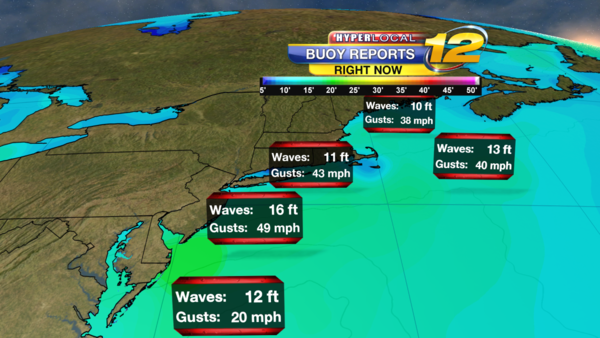 As of Noon on Tuesday, waves south of Long island are in the 5 to 10 foot range. As the TS Joaquin gets closer to Long island - waves could range from 10 to 15 feet. Right now expect tides to run about 1 foot above normal Friday to Sunday. it is possible that tides could go 3 to 4 feet above normal and that would lead to moderate flooding. 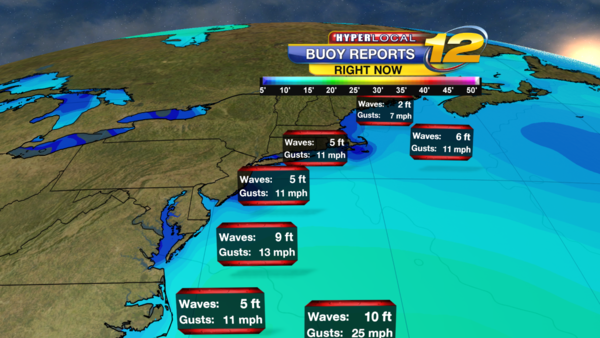 Tropical Storm Irene tides where 5 to 7 feet above normal. Be prepared and Be Alert for the changing weather forecast. 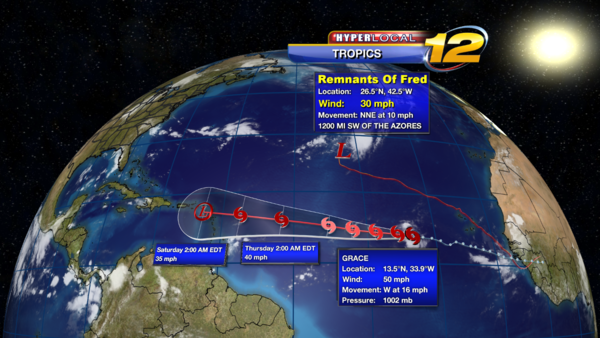 SATURDAY: TRACKING TROPICAL STORM JOAQUIN (wah-KEEN) Mostly Cloudy skies. A few showers. Breezy. East-Northeast 10 to 20 mph. 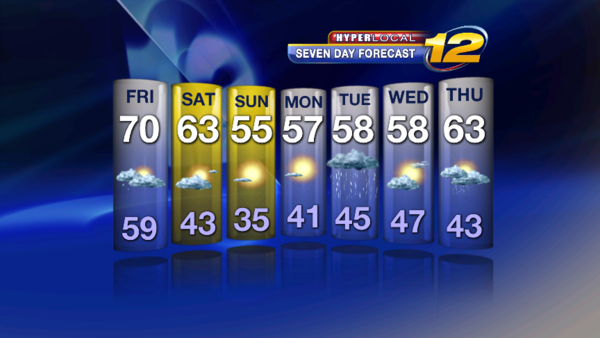 Highs 63 to 68. SATURDAY NIGHT: Mostly cloudy. Scattered Showers. Threat for heavy rain. Windy. Chilly. East-Northeast 15 to 30 gusts to 40 mph. Lows 52 to 57. 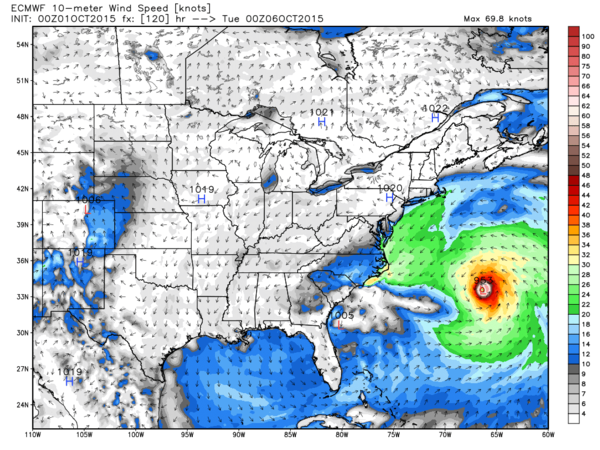 SUNDAY: TRACKING TROPICAL STORM JOAQUIN (wah-KEEN) Depending on track we could have strong winds, heavy rain and coastal flooding. 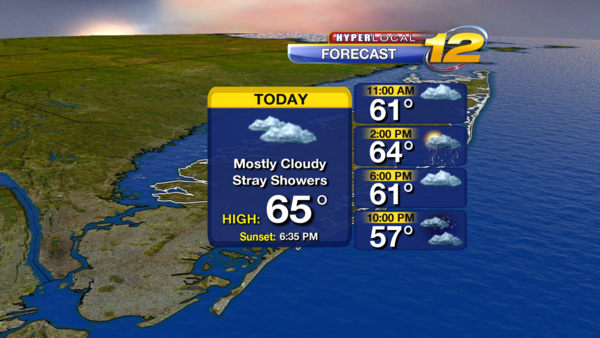 Mostly cloudy skies with showers. Windy. 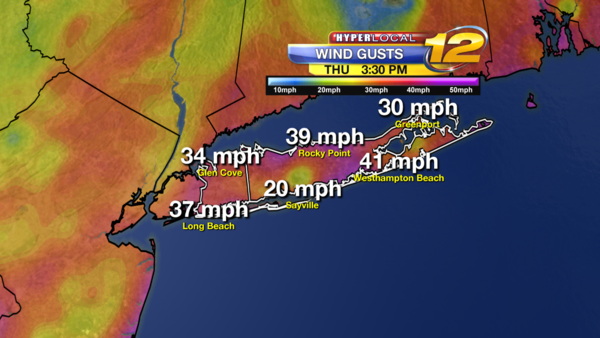 Winds could gust 30 to 40 mph. 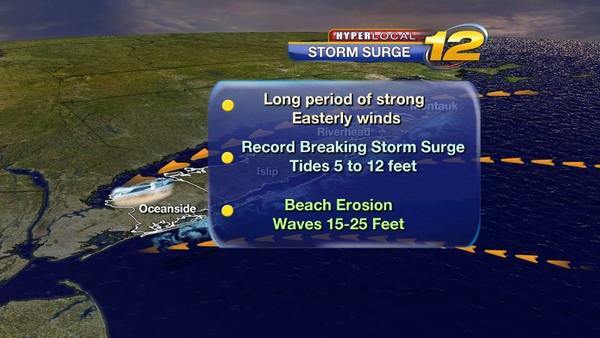 Beach Erosion and Coastal Flooding possible. Highs 65 to 70. SUNDAY NIGHT: Cloudy with showers. Windy. Lows 50 to 55. Joaquin top winds are up to 105 mph as the storm drifts around the Bahamas. Here is the 5 pm Wednesday Hurricane Center forecast which shows a track left of previous forecasts and it may shift even farther west in the next day or so. Still, LI will be close to or within the zone of forecast error so we have to be prepared for hurricane conditions late Sunday into Monday. 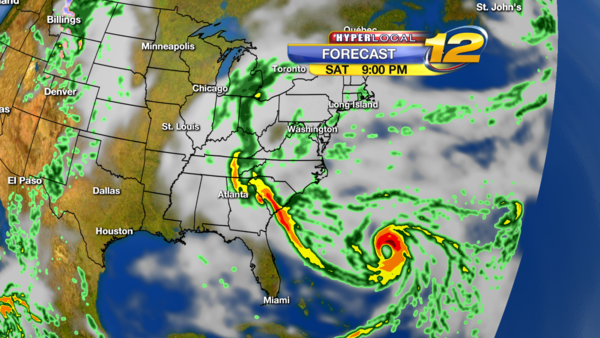 The official track shows the storm near Cape Hatteras , NC on Sunday. 1st let's talk about the forecast next 3 days - A storm along the coast will bring strong winds and coastal flooding and large waves. This has nothing to do with Hurricane Joaquin. 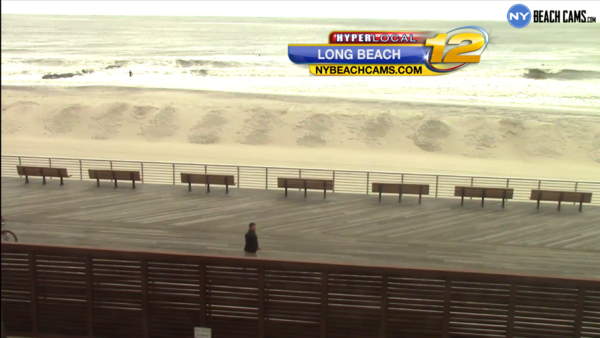 TODAY: Coastal Flood Advisory, High Surf Advisory. 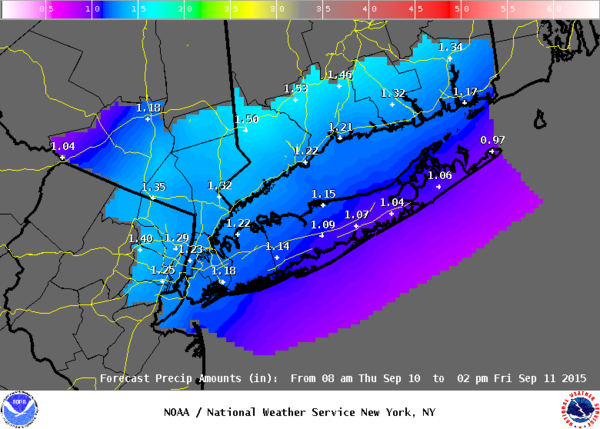 Be alert for Coastal Flooding through weekend. Mostly Cloudy skies. 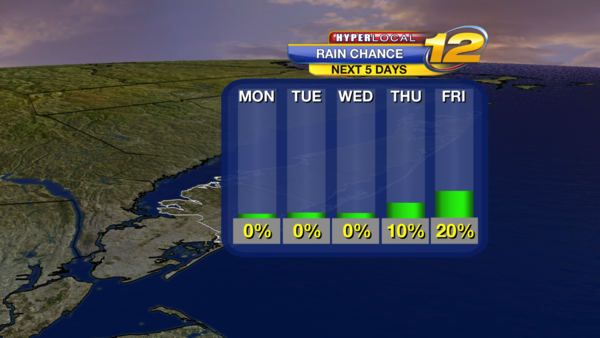 Chance for a few stray showers. Windy. Winds North-Northeast 15 to 20 mph with gusts to 30 mph. Minor Coastal Flooding during high tides. Highs near 65. Sunset: 6:35pm. TONIGHT: Coastal Flood Advisory, High Surf Advisory. 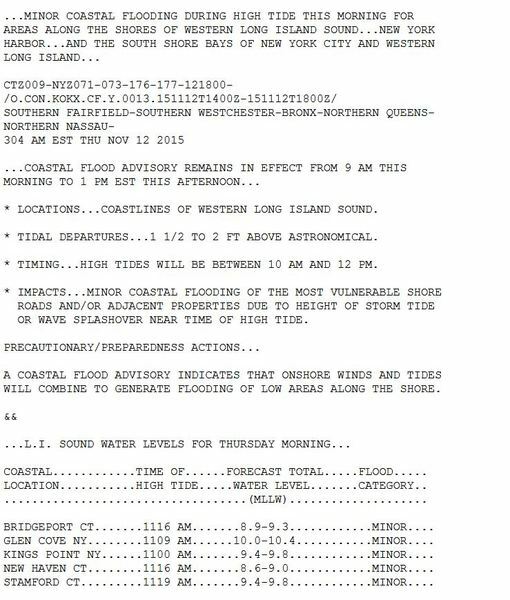 Be alert for Coastal Flooding. Cloudy skies. A few showers. Windy and Cold. Winds North-Northeast 15 to 20 mph with gusts to 30 mph. Minor Coastal Flooding during high tide. Lows near 50. Sunrise: 6:50am. 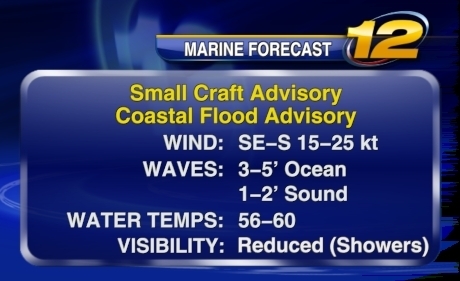 TOMORROW: Coastal Flood Advisory, High Surf Advisory. 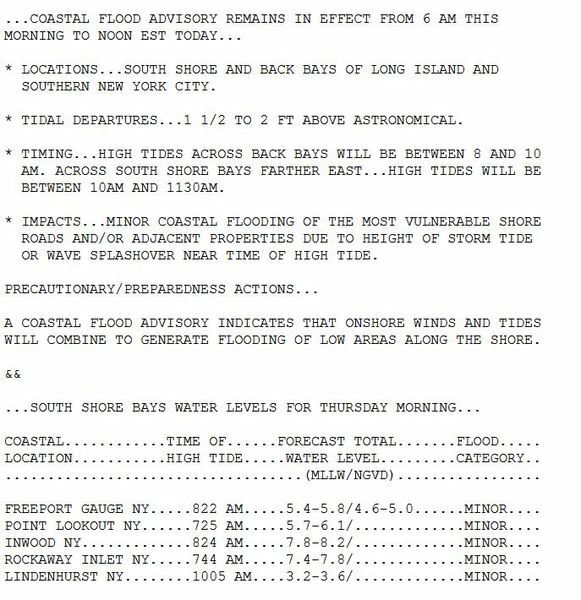 Be alert for Coastal Flooding. Cloudy skies. 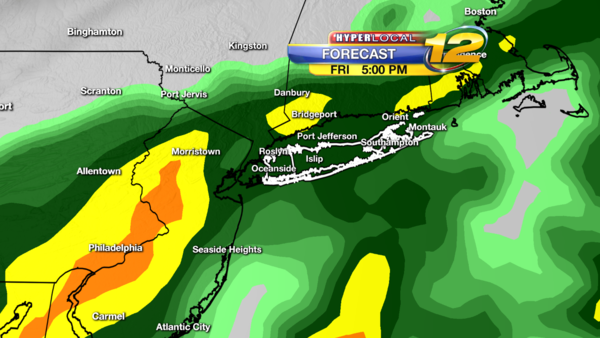 Periods of Rain, Some will be heavy at times. Windy and Cold. Winds North-Northeast 15 to 25 gusts to 40 mph. Heavy rain with some street flooding. You can see Hurricane Joaquin , bottom of image. 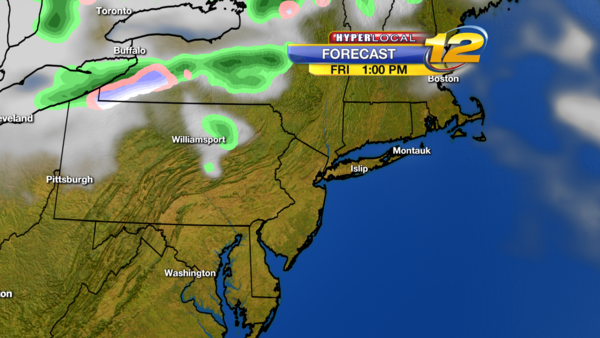 FRIDAY NIGHT: Cloudy with some scattered showers. Windy. 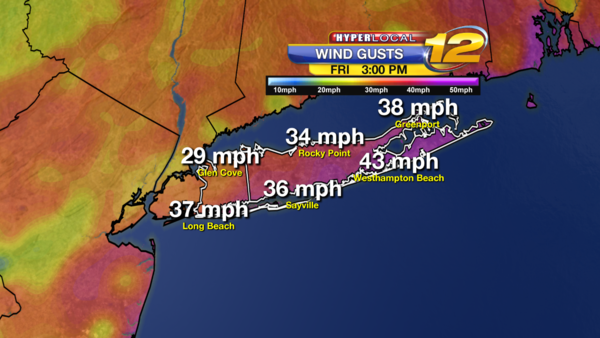 Winds 20 to 30 mph with gusts to 40 mph. Cold. Lows in the upper 40s to low 50s. Watch for some coastal flooding during high tide times. 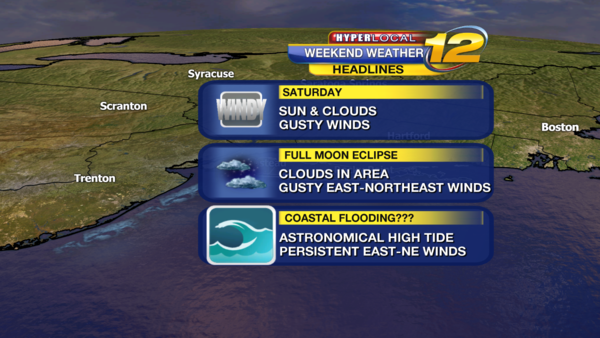 SATURDAY: Coastal Flooding possible during high tides. Waves 5 to 10 feet. 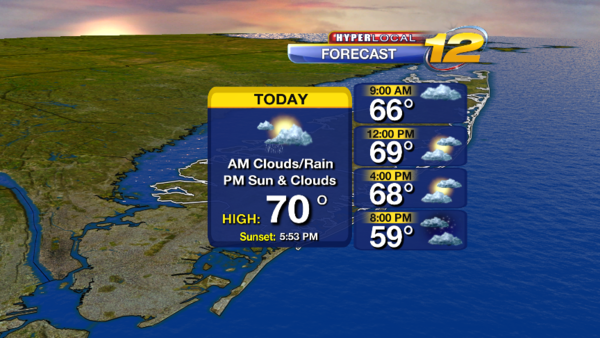 Mostly Cloudy skies with a few showers possible. Most of the day is ok. Windy. Wind East-Northeast 20 to 30 mph with gusts to 40 mph. Some power outages possible. Highs 60 to 65. STRONG WINDS FRIDAY NIGHT THROUGH SUNDAY WILL LEAD TO SOME POWER OUTAGES - WINDS SUSTAINED 20 TO 30 MPH WITH GUSTS 40 TO 45 MPH. SATURDAY NIGHT: Cloudy with chance of showers. Windy. Wind East-Northeast 20 to 30 mph with gusts to 40 mph. 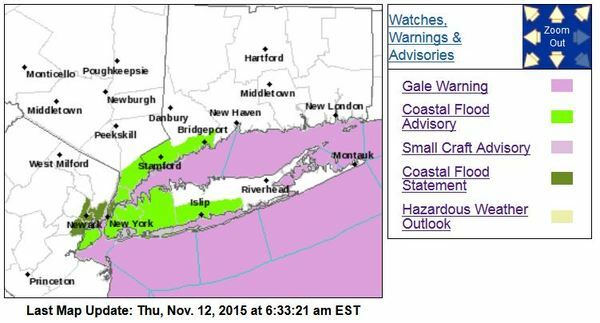 BE ALERT for coastal flooding and Beach Erosion. Lows 50 to 55. Saturday 9pm Hurricane well away from land. Some changes in the forecast since Wednesday. 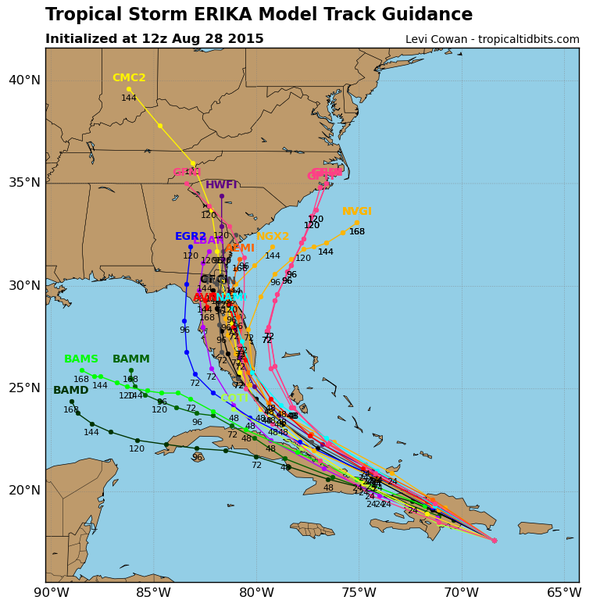 5am Track - Please now the white lines - that is called the cone of uncertainty. The forecast track of the storm can go all the way to the west or to the east. 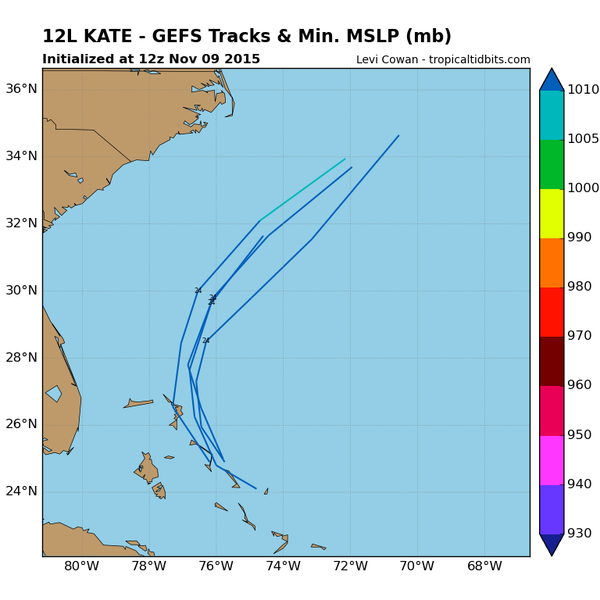 IF the track follows the eat white line Joaquin will miss Long Island and Go OUT TO SEA. This is possible and two computer models support this. 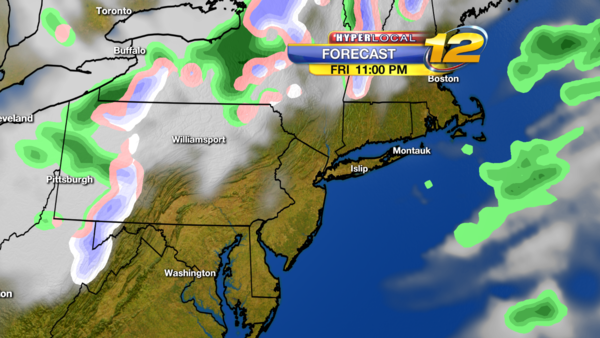 FRIDAY NIGHT: Cloudy with some scattered showers. Windy. Winds 20 to 30 mph with gusts to 40 mph. Cold. Lows in the upper 40s to low 50s. 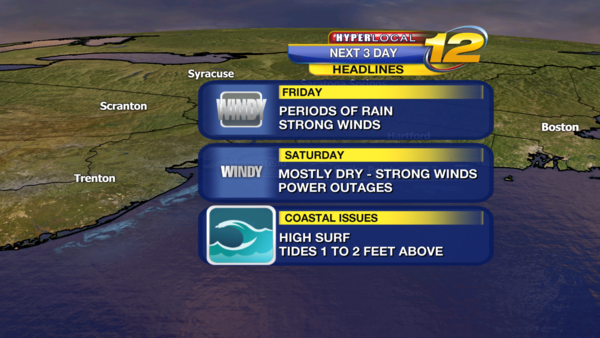 Watch for some coastal flooding during high tide times.SATURDAY: Coastal Flooding possible during high tides. Waves 5 to 10 feet. 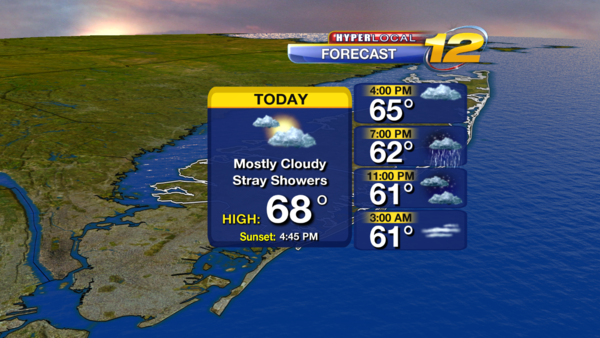 Mostly Cloudy skies with a few showers possible. Most of the day is ok. Windy. Wind East-Northeast 20 to 30 mph with gusts to 40 mph. Some power outages possible. Highs 60 to 65. Below Map is for 8am saturady. 5am Track - Please note the white lines - that is called the cone of uncertainty. The forecast track of the storm can go all the way to the west or to the east. 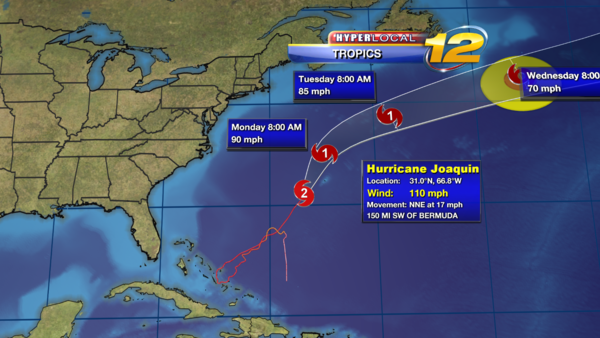 IF the track follows the east white line, Joaquin will miss Long Island and Go OUT TO SEA. This is possible and two computer models support this. See below. 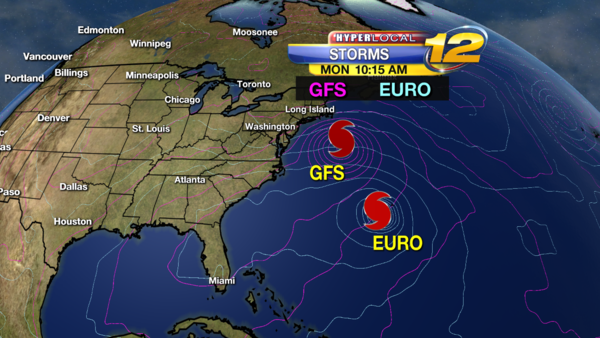 Here is the updated tracks from the GFS and Euro Models BOTH now off shore and Way from the East Coast. Here is the GFS Monday from 6z oct 1st - map is for 8am Monday Oct 5th - It shows the hurricane missing Long Island and going to the East. 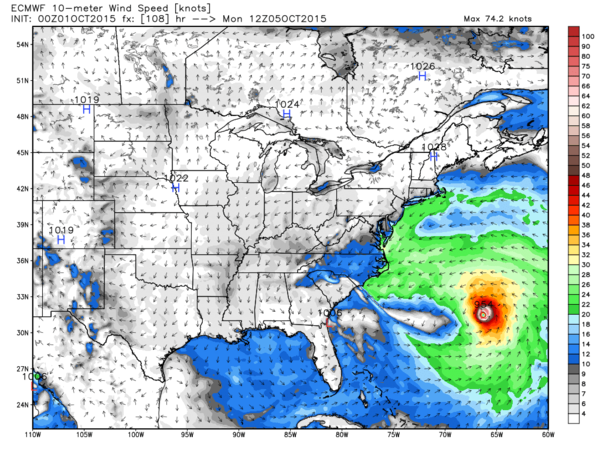 8PM MONDAY OCT 5TH - NOTICE JOAQUIN WELL OUT TO SEA AND AWAY FROM LONG ISLAND. So what is the update? A change to the east in Storm track - that is good news - On the new current track we would have impacts Late Sunday into Tuesday morning - IF it goes with the latest track - The trend the past 12 hours has been for the storm to move EAST out to Sea. Why the change in track and timing - The storm has been moving very slow - so it hasn't been picked up yet but the mid latitude winds ( Jet Stream) to help steer it north. Since the movement north has been delayed the East Coast wind pattern has changed a bit and this will help steer the storm away from the coast. 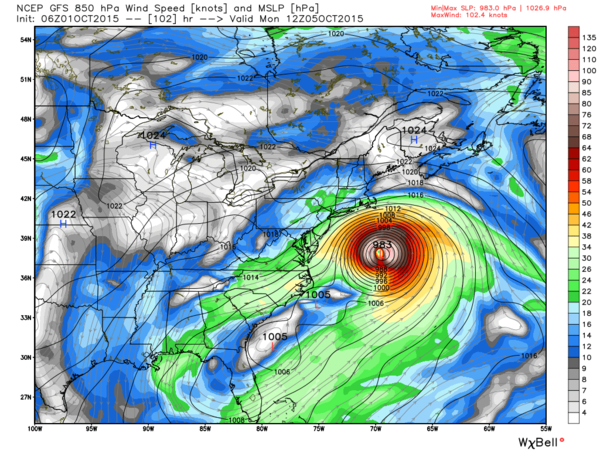 If Joaquin Speeds up and move north faster than expected a direct hit would be possible on Long Island. 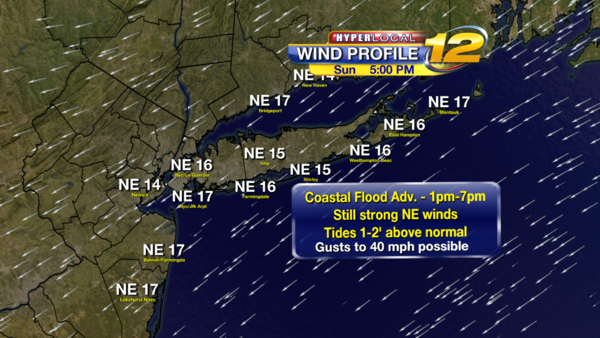 We still have to watch for the threat of strong winds and coastal flooding. 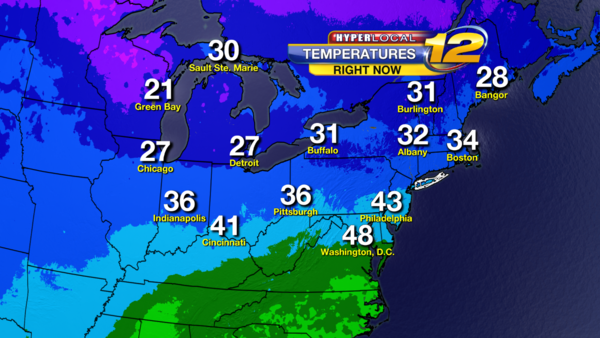 Notice the shift EAST compared to the below weather maps. 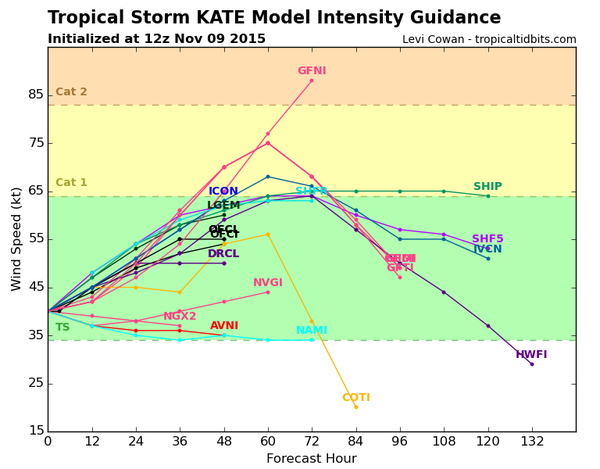 The trend over the last 18 hours is for the track of Joaquin to go farther right and off shore. 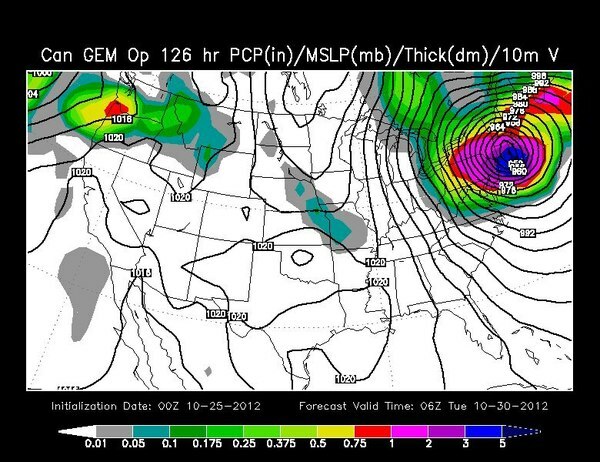 This may be a temporary thing but at least there is some hope that the east coast and LI will be spared a direct hit. It is now a Cat 4 130 mph storm still hovering over the Bahamas. 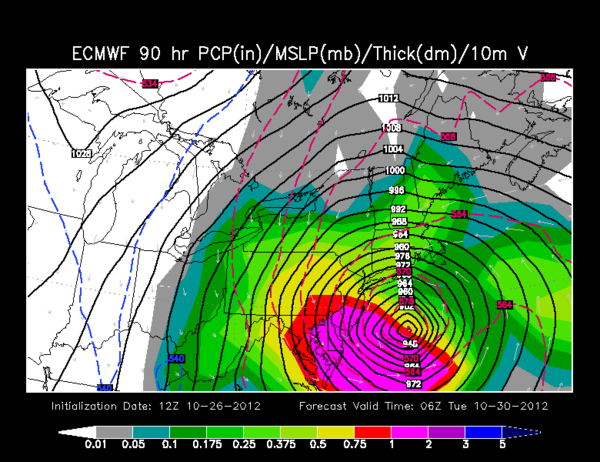 Even if it does eventually get close to us on Monday the storm should weaken to a Tropical Storm. Of course that would still do damage but not as much as a Cat 1 or 2 storm. Not associated with Joquin are the strong winds, rain and coastal flooding we will encounter through Friday into Saturday. 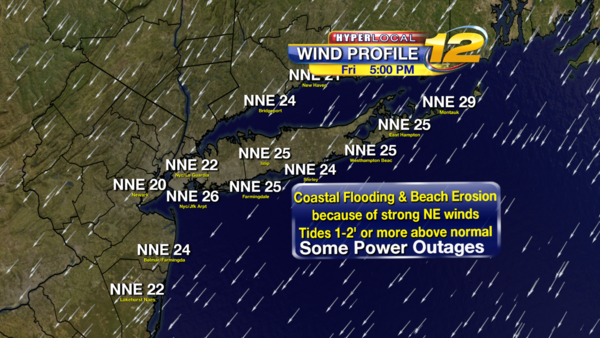 The worst may be coastal flooding because of persistent on shore winds. Tides could be more than 2 feet above normal. Winds gusting to 40 mph may cause some scattered power outages. 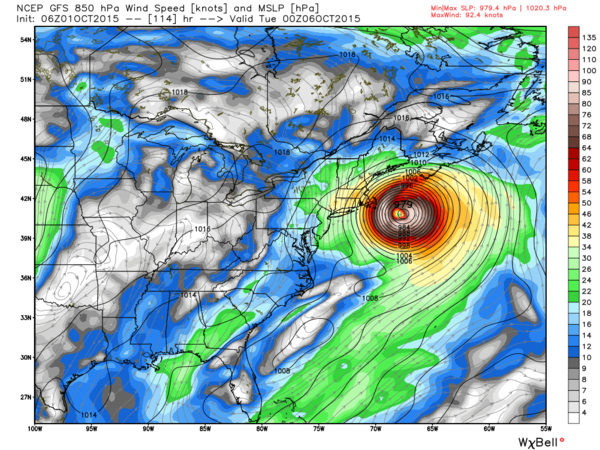 Joaquin Late Sunday Monday into Tuesday with correct track...- Some gusty winds, possible coastal issues, Since our beaches have been battered all weekend long. Large waves as the storm moves east of Long Island. Do we still have a risk of getting a hit from the storm- YES a small one. If the storm tracks on the west side of the cone in the forecast track, we could have strong winds, coastal flooding and beach erosion. We still have to watch closely. Strong winds and Large waves in the Atlantic Ocean. Minor coastal flooding during high tides. Power outages possible through weekend. Average high is 69. Sunset: 6:33pm. gusts to 40 mph. Some power outages possible. Lows near 50. 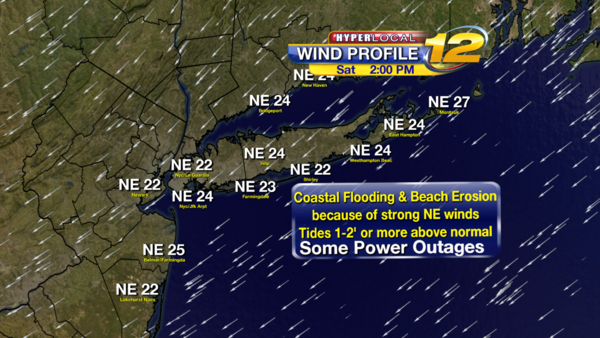 TOMORROW: Minor coastal flooding and beach erosion. 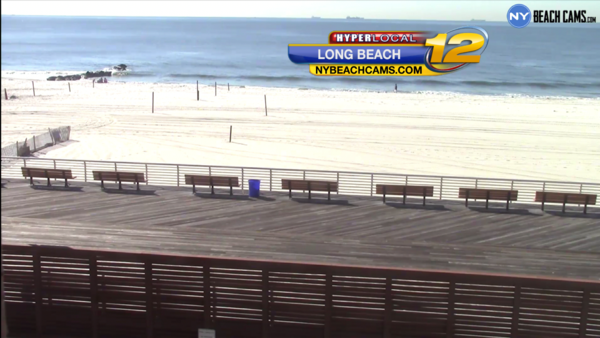 Tides running1 to 2 feet above normal and Waves 5 to 8 feet at the shoreline and 10 to 15feet off shore. Morning scattered showers. Mostly Cloudy. Chance of showers in the afternoon. Windy. 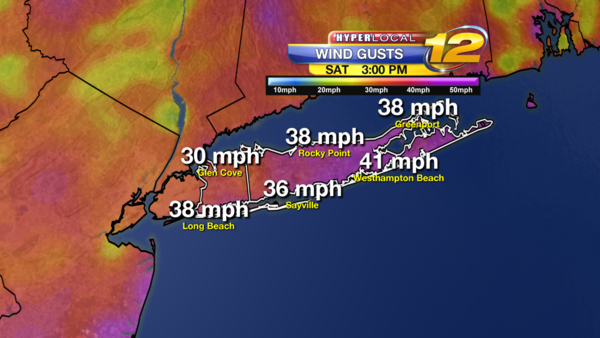 Winds Northeast 15 to 25, gusts to 40 mph. Highs near 60. TOMORROW NIGHT: Mostly Cloudy with a few showers. Windy. Lows 50 to 55. 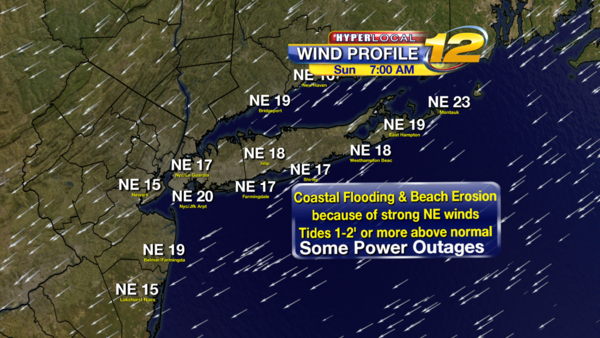 SUNDAY: Minor coastal flooding and beach erosion. Tides running 1to 2 feet above normal and Waves 5 to 8 feet at the shoreline and 10 to 15 feet off shore. Mostly Cloudy skies a few scattered showers. Windy. Winds Northeast15 to 25 gusts to 35 mph. Highs near 64. SUNDAY NIGHT: Mostly cloudy. A few showers possible. Lows 55 to 60. 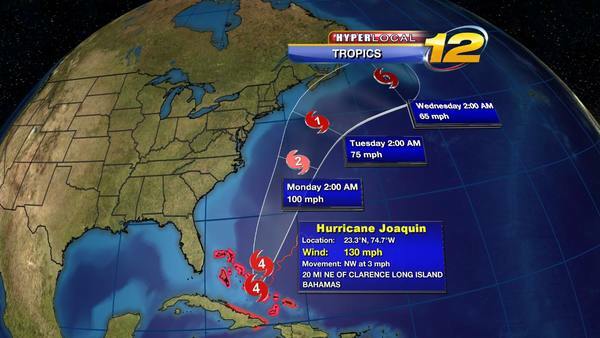 MONDAY: TRACKING JOAQUIN - The storm will be east of Long Island as a Category 1 hurricane with winds 80 to 90 mph. Mostly cloudy skies with some scattered showers. Breezy. Some gusts to 30 mph. Highs near 70. Minorcoastal issues possible depending how far east Joaquin will track. TUESDAY: Mostly cloudy with a few light showers or sprinkles.Highs near 70. Lows near 55. WEDNESDAY: Partly sunny. Highs near 72. Lows near 54. THURSDAY: Mostly sunny skies. Highs near 70. Lows near 52. There is still rough surf and the threat for minor coastal flooding this afternoon along the south shore and closer to this evening along the north shore of Long Island. We are continuing to see some improving weather conditions as we go throughout the rest of this Sunday across Long Island. 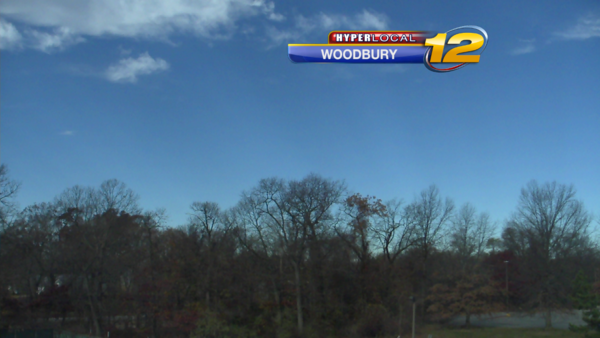 Clouds mixing with sunshine and blue sky - temps a bit milder than yesterday! We still have a couple of weather concerns - gusty winds and minor coastal flooding during this afternoon's high tide cycle. 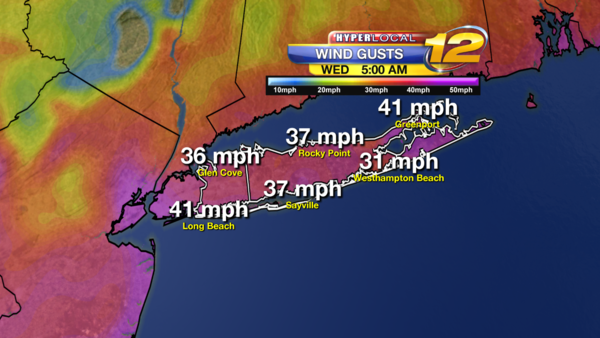 Winds continue out of the northeast today, with gusts as high as 40 mph possible. Those tides are running 1 to 2 feet above normal still today so that prompts the Coastal Flood Advisory as some minor coastal flooding can occur in those low-lying areas along the shoreline. In terms of Hurricane Joaquin -- thankfully we missed this one! Joaquin continues to weaken now and head off to the northeast across the Atlantic. This will continue to be a problem for Bermuda today with Hurricane Warnings posted there. After that, Joaquin is out to sea and definitely not an issue for Long Island. What an impressive storm though - at its peak of a borderline category five storm especially. Today: Sun and Clouds, but mostly cloudy tonight. 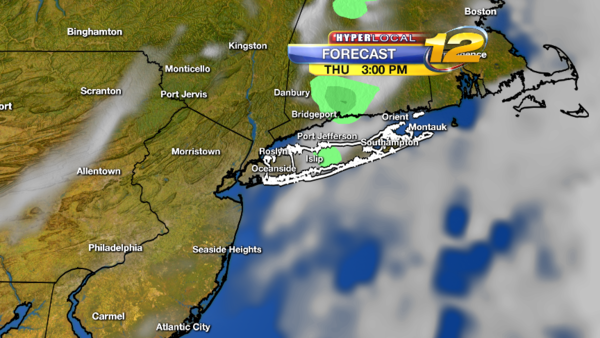 You can see a nearby sprinkle - could see one across Long Island, but a better chance of staying dry. 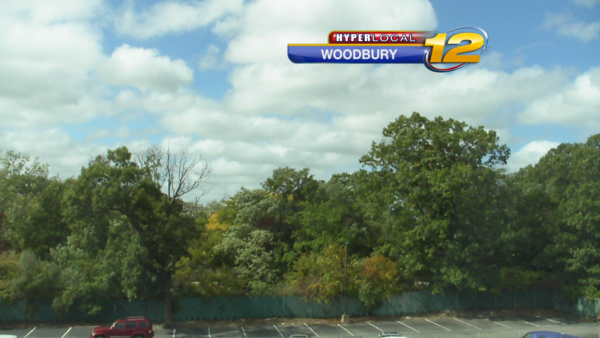 By Monday afternoon, once again seeing a mix of sun and clouds - looking nice outside again! It will stay breezy for Monday, but less-so as the wind continues to subside. Light winds by Tuesday and, as you can see below, sunny with temperatures in the lower 60's by late Tuesday AM. Upper 60's by afternoon! 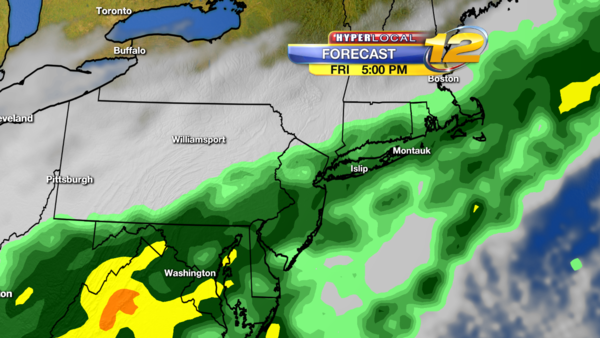 Next chance for any more rain looks to be later Friday night into Saturday at this point. 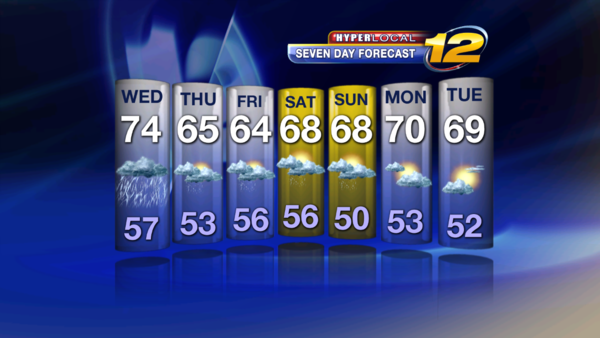 See 7 day forecast below. So, after some no-so-great weather the past few days - get ready for a nice stretch coming up...have a great day and a great work week! 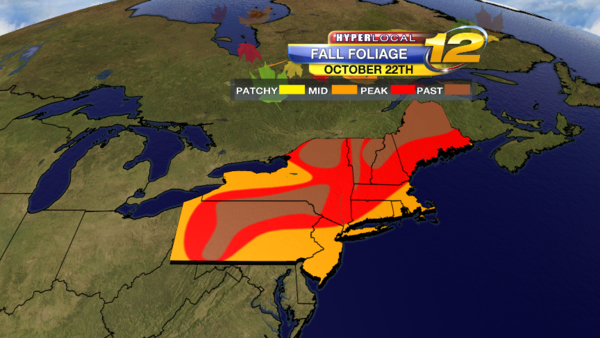 Get the Cameras ready for some beautiful Fall Foliage the next week, we are near Peak here on Long Island. 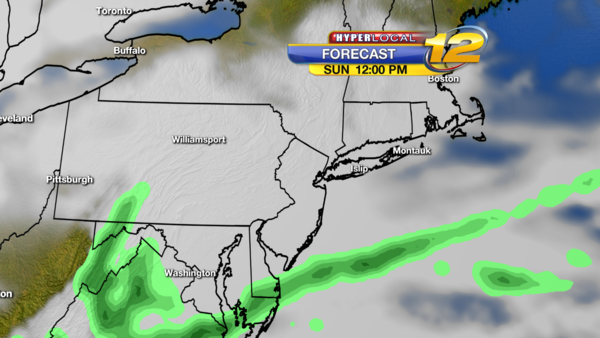 Most of the weekend will be dry, but some showers will accompany a cold front Sunday morning. If you are heading out bring the jacket and make sure you protect plants and vegetation. 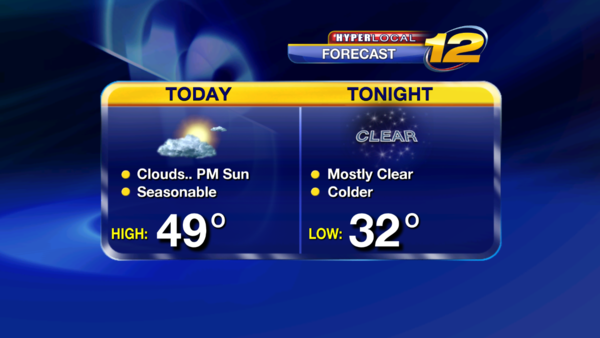 Frost Advisory in effect for Suffolk County. County. Protect Plants. Sunrise: 7:14am. 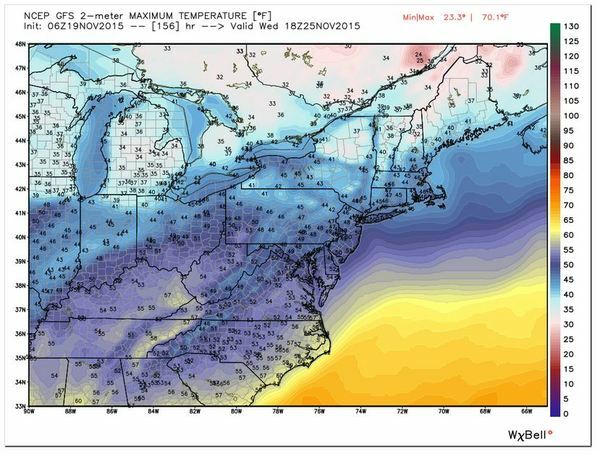 Look at the Map beach for the cold temperatures. cloudy. A few showers towards morning. Lows 42 to 47. On Saturday a storm will be approach and clouds will increase through the day, becoming mostly cloudy by afternoon. Mostly Sunny. Highs near 58. Overnight will be partly cloudy and cold. Lows 37-42. See rain total from October 28th to 30th. Don't forget to share your fall photos with us to be used on-air! After today, noticeably cooler for Monday with sunshine through Tuesday. 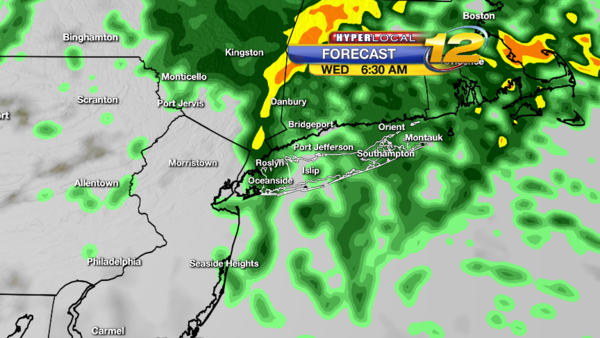 Rain, heavy at times, moves in for Wednesday. There could be some early morning showers left over on Thursday. 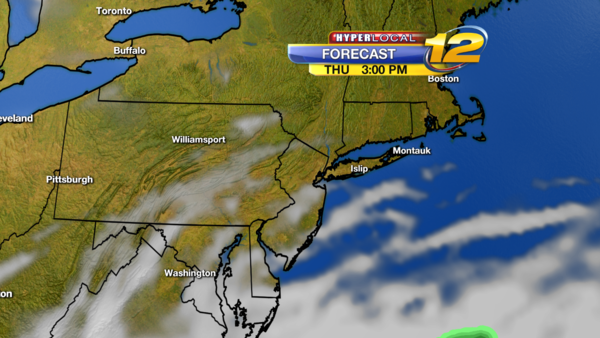 Then, sunshine breaks out for Thursday afternoon. HALLOWEEN looks nice for Saturday. DON'T FORGET! Clocks go BACK one hour Saturday night! TODAY: Mostly Sunny skies. 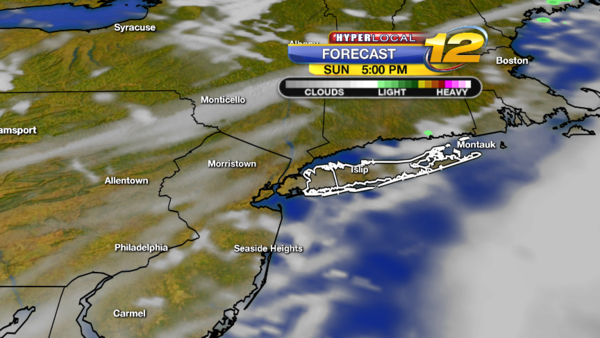 A few clouds along the south shore. Winds North-Northeast 5 to 10 mph. Highs near 58. Sunset: 5:57pm. TONIGHT: Clear Skies. Cold. Winds Northeast-East 5 to 10 mph. Lows 37 to 42. Sunrise: 7:17am. TOMORROW: Morning sunshine giving way to afternoon clouds. Winds East-Southeast 5 to 10 mph. Highs near 57. 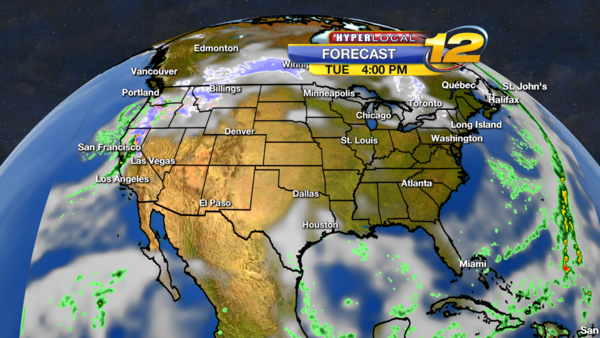 High Pressure (BLUE HIGH ON MAP) overhead on Tuesday - We track storm near gulf coast moving towards Long Island. TOMORROW NIGHT: Cloudy. Chance of showers towards morning. Lows near 46.WEDNESDAY: Cloudy skies. Periods of rain. Highs 60 to 65. 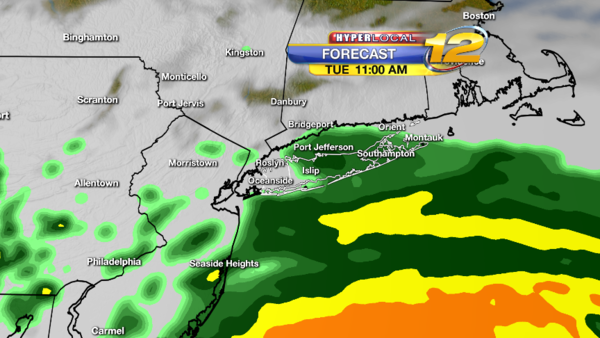 Weather Map shows storm and moderate rain developing over Long island during the day on Wednesday. WEDNESDAY NIGHT: Cloudy with periods of rain. Some thunderstorms. Some rain could be heavy at times. Windy. Winds South-Southwest 15 to 20 mph, gusts to 30 mph. Minor coastal flooding possible. .75" to 1.25" of rain. Lows near 56. 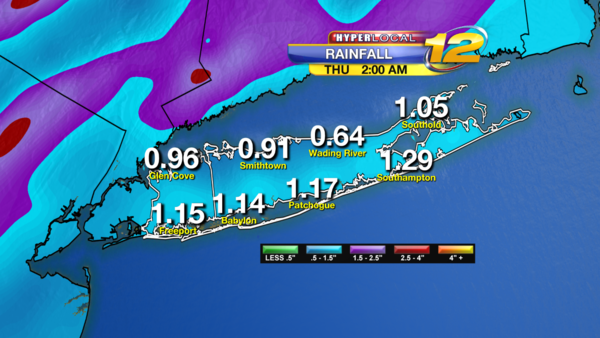 Forecast Rain totals Wednesday into Thursday. 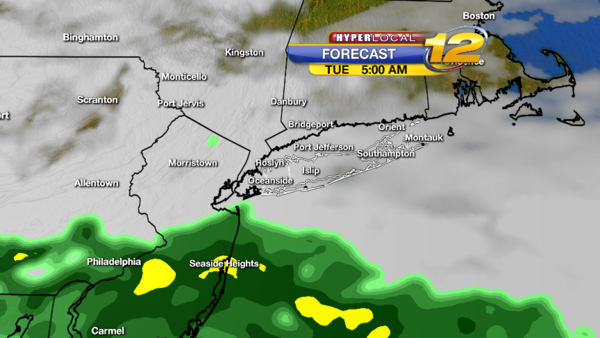 THURSDAY: Cloudy Skies with showers in the morning. Partly Sunny in the afternoon. Highs near 68. THURSDAY NIGHT: Partly cloudy. Lows near 49. FRIDAY: Mostly Sunny. Highs 55 to 60. FRIDAY NIGHT: Mostly clear. Lows 40 to 45. SATURDAY: Mostly Sunny. Highs 52 to 57. Weather for Halloween Looks good. Right now dry and a little chilly. SATURDAY NIGHT: Clear skies. Lows 40 to 45. SUNDAY: DAYLIGHT SAVING TIME ENDS. 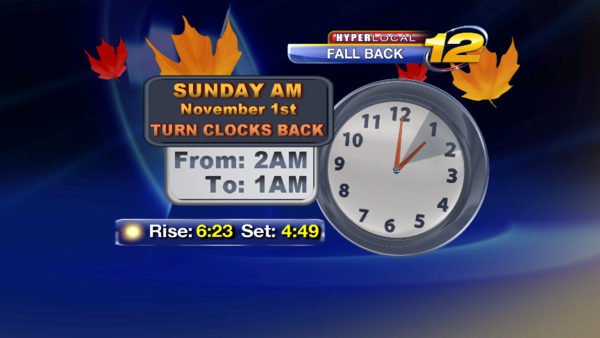 Turn Clocks back one hour. Check/Change batteries in Smoke Detectors and Carbon Monoxide Detectors. Sunrise: 6:23am. Sunset: 4:49pm. Sun and Clouds. Highs 52 to 57. NYC MARATHON WEATHER LOOKS PERFECT FOR THE RUNNERS. 40s to start the race and low 50s to end the race. West Winds 5 to 15 mph. SUNDAY NIGHT: Partly cloudy. Lows 42 to 47. 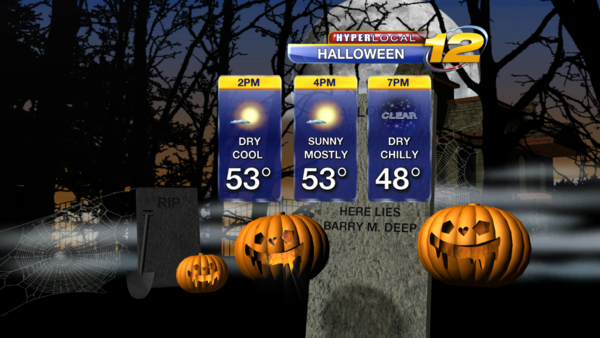 Looking good Friday and into Halloween on Saturday. Chilly for trick-or-treating. NYC Marathon on Sunday looks okay. Partly sunny with the slight chance for a passing shower. See a look at the rest of the next 7 days below - have a great night! TODAY: Some minor flooding this morning during high tide. Tides running 1 to 1.5 feet above normal. Clouds and some rain this morning. 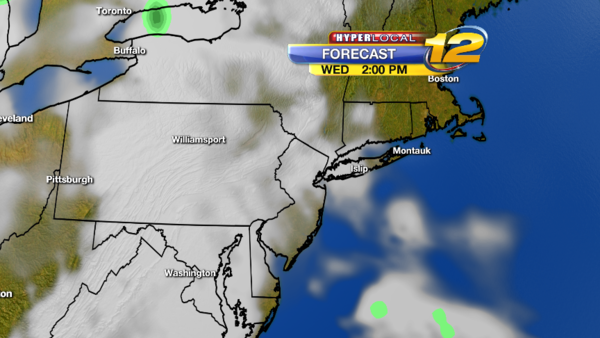 Sun and Clouds this afternoon with a small chance of a few spotty showers between 1 and 3pm.. Breezy. Winds West-Southwest 10 to 15 gusts to 25 mph. Highs near 70. Record High is 73 set in 2014. Normal Average High is 59. Sunset:5:53pm. TONIGHT: Mostly Clear. Cooler. Winds West 5 to 10 mph. Lows near 46. Sunrise: 7:21am. TOMORROW: Mostly Sunny Skies. Breezy. Winds West-Northwest 10 to 15 mph. Highs near 59. TOMORROW NIGHT: Mostly clear. Cold. Lows 35 to 40. Patchy Frost.SATURDAY: HAPPY HALLOWEEN. Mostly Sunny Skies, some late day clouds. Highs 55 to 60. SATURDAY NIGHT: Mostly cloudy. Lows 42 to 47. SUNDAY: November 1st. DAYLIGHT SAVING TIME ENDS. 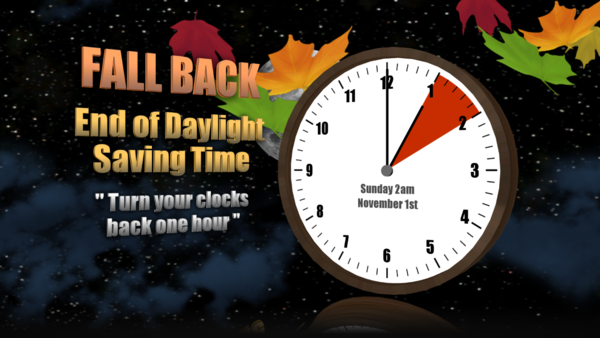 Turn the Clocks back one hour at 2am. Check batteries in smoke and carbon monoxide detectors. Sunrise: 6:23am. Sunset: 4:49pm. Mostly Cloudy skies with a chance for a few showers. Highs near 60. NYC MARATHON WEATHER: Mostly Cloudy. Temperatures 48 to 53, chilly at the Start. 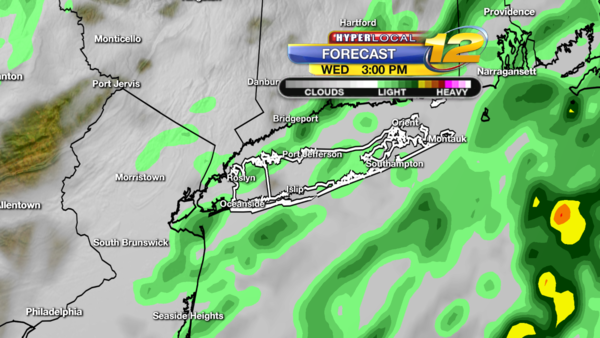 Mostly Cloudy, 58 to 63 between 2 and 4pm. Chance of a shower. SUNDAY NIGHT: Mostly cloudy. Chance of a shower. Lows 45 to 50. 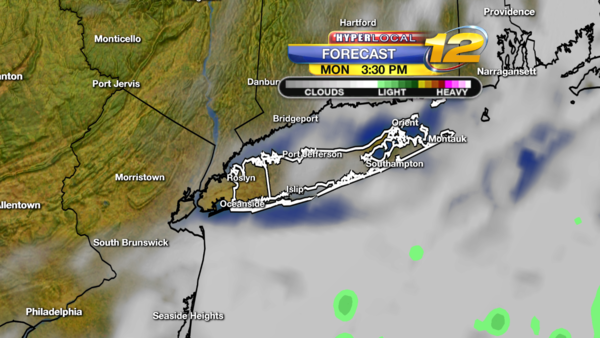 MONDAY: Partly Sunny to Sun and Clouds. Highs near 63. MONDAY NIGHT: Partly cloudy. Lows 47 to 52. TUESDAY:ELECTION DAY: Sun and Clouds. Warm. Highs 62 to 67. TUESDAY NIGHT: Partly cloudy with lows near 50. WEDNESDAY: Sun and Clouds. Warm. Highs 63 to 68. WEDNESDAY NIGHT: Partly cloudy. Lows 45 to 50. TODAY: Some minor flooding this morning during high tide. Tides running 1 to 1.5 feet above normal. 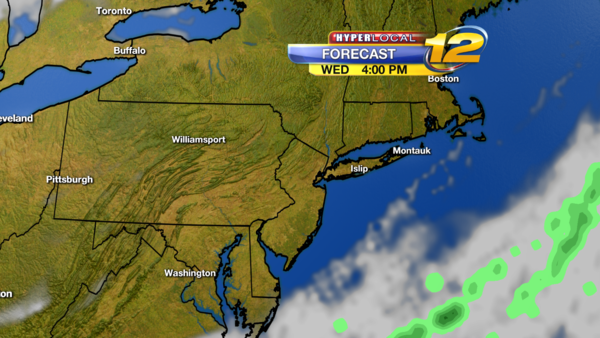 Sun and Clouds this afternoon with a small chance of a few spotty showers between 1 and 4pm.. Breezy. Winds West-Southwest 10 to 15 gusts to 25 mph. Highs near 70. Record High is 73 set in 2014. Normal Average High is 59. Sunset:5:53pm. I remember the days leading up to Sandy a lot of friends and family kept asking is this going to happen and how bad will it be. I kept telling them it would be very bad along the coast. I grew up near the water and the past 11 years living south of Montauk Highway in Babylon. The question was HOW Bad. 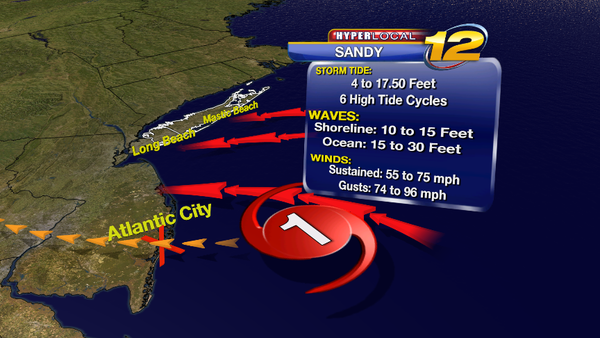 We had tropical storm Irene in August of 2011 which prepared some for what would come with Sandy. 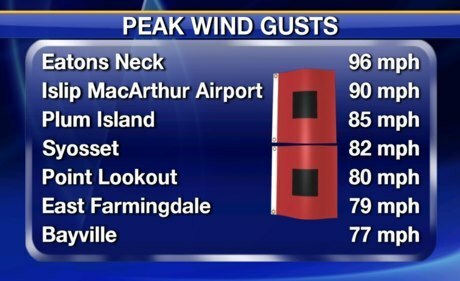 Long Island had been spared by most storms over the past 30 years. Hurricane Gloria in September 1985 was the last Hurricane to directly hit Long Island. 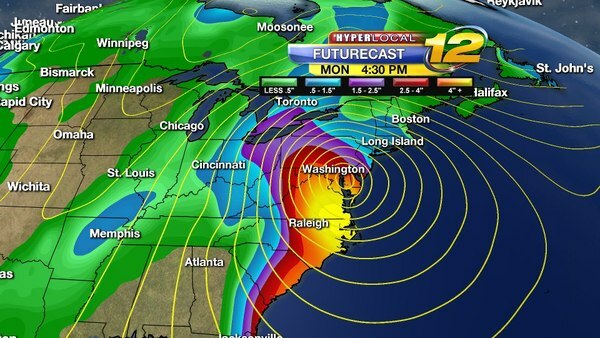 One thing I have learned since Sandy , that even with a good forecast some people don't understand the impacts. This is something I will and other meteorologists are working on to communicate better. For example, the forecast called for a storm surge of 5 to 12 feet. What does that mean to people who live on the South Shore. It means water into the streets and water into their homes. In some cases 6 feet of water into the 1st floor of a house. 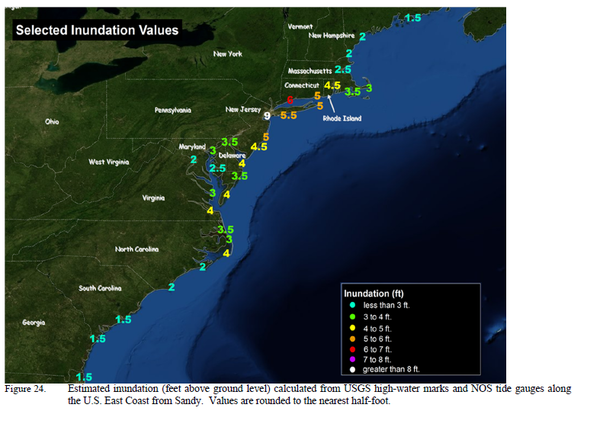 The below map shows water gauges and how high the water level was above Ground Level. 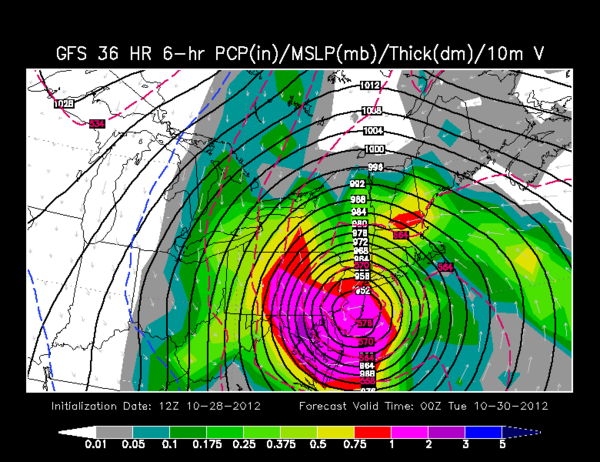 The Below models showed the forecast Track of Sandy. When the models back in October of 2012 starting showing the threat of a Hurricane hitting the East Coast I got sick to my stomach. I remembered Gloria and had a bad feeling. Like with all storms, we continue to learn - 1. Forecasting 2. Communication of the forecast. 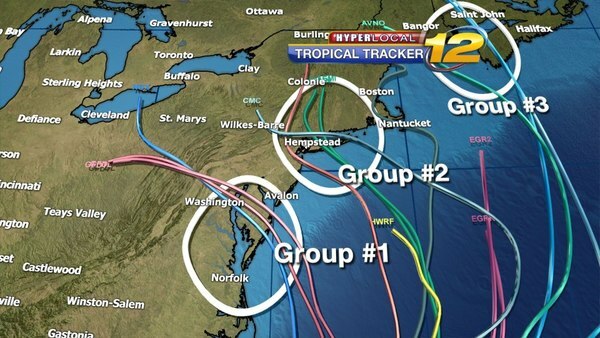 A storm like this will happen again - History shows we get with Hurricanes on Long Island. It is not a question of IF, but WHEN and we need to be prepared. Some of our neighbors are still not back in their homes, three years later. It has been a very difficult journey for some of our Long Islanders. 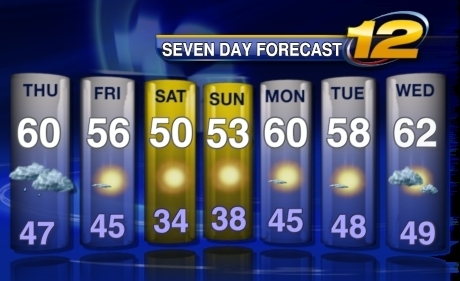 Warm weather will continue through Saturday. Highs will be 8 to 15 degrees above normal. Good chance of a record high on Friday. 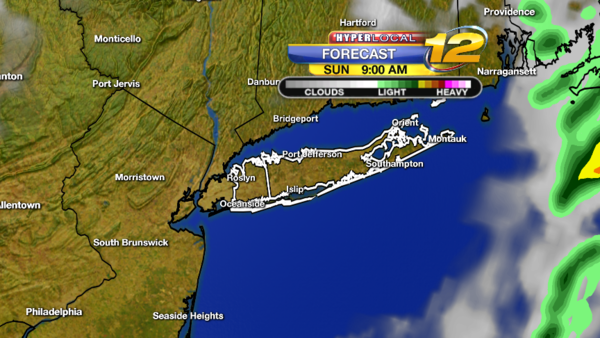 Drier, Cooler, & Sunny for Sunday. TONIGHT: Cloudy skies with Fog. A few spotty showers. Warm. Lows 55 to 60. Winds South-southwest 5 to 10 mph. Sunrise: 7:29am. TOMORROW: Morning Dense Fog. Mostly Cloudy Skies. A few stray showers. Warm and Breezy. Winds South-Southwest 10 to 15 mph. Highs near 70. Record High is 68 set in 1994. FRIDAY NGIHT: Mostly cloudy with a few showers. Lows 55 to 60.SATURDAY: A few showers in the early morning. Mostly Cloudy Skies. Breezy. Highs 60 to 65. Overnight will be partly cloudy. Lows 40 to 45. SUNDAY: Mostly Sunny. Cooler. Highs near 55. Overnight will be clear and cold. Lows 36 to 42. MONDAY: Mostly Sunny. Highs 55 to 60. Overnight will be clear and cold. Lows 37 to 42. TUESDAY: Sun and Clouds. Highs 55 to 60. Overnight will be partly cloudy. Lows 40 to 45. WEDNESDAY: Sun and Clouds. Highs 55 to 60. Overnight will be partly cloudy. Lows near 45. As we continue to experience these above normal temperatures to start November, we have a few changes approaching for the upcoming weekend. Now, for the all important question: "How is the weekend looking?!" On Saturday, we'll start with cloudy skies. 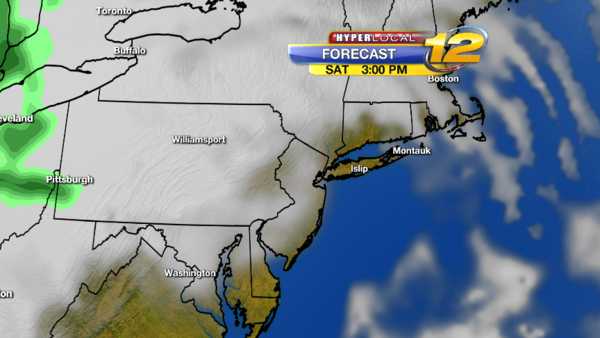 Then, expect a mix of sun and clouds by the afternoon. 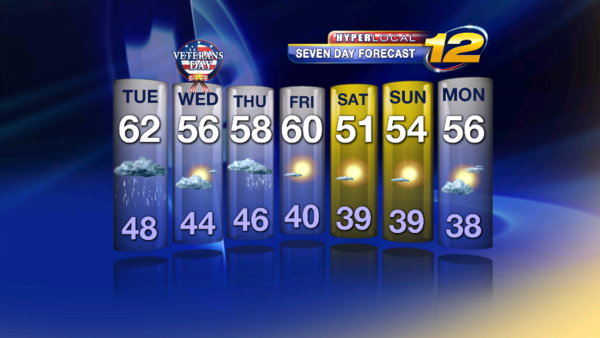 It will still be mild, but not as warm as the past few days. Here's a more detailed look at our upcoming weekend - Clouds break throughout the day Saturday with highs in the lower 60's. 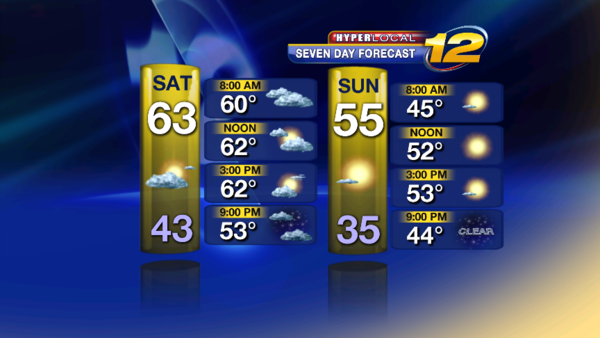 Notice the big change in temperatures by Sunday! 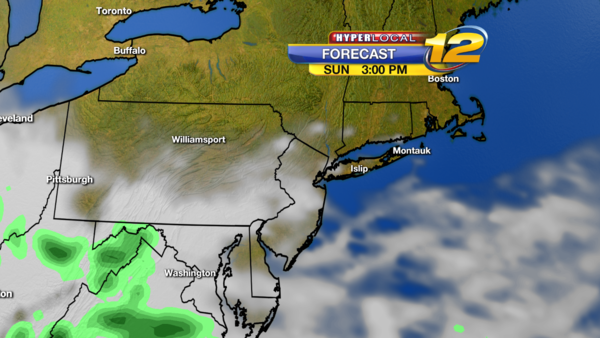 It will be a great looking day for Sunday though with plenty of sunshine. 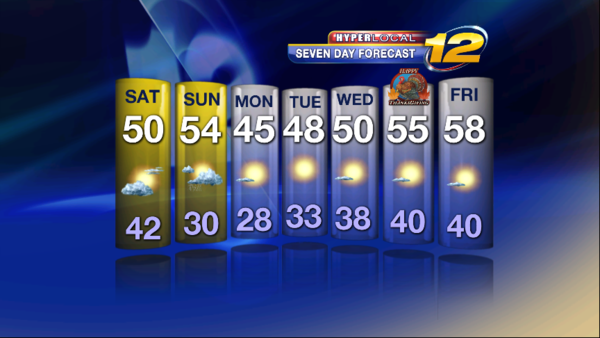 We'll start Sunday in the 40's and only reach the mid 50's by Sunday afternoon. Back to jacket weather! Normal high for Sunday = 56 degrees. By Sunday night it will feel COLD again. 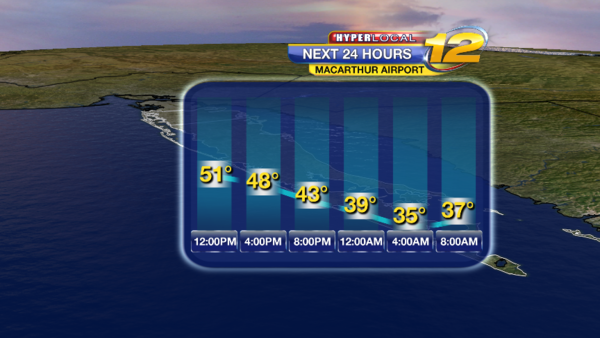 Overnight lows around 35 degrees, but easily some 20's towards the Pine Barrens! Have a great night and a great start to your Friday! 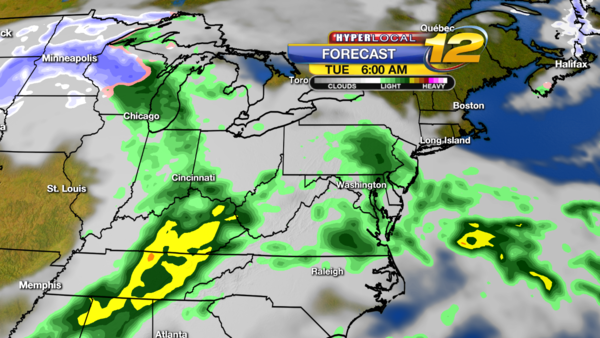 A storm on the way for Tuesday and it will bring periods of rain. We really could use a good soaking rain. We are more than 8 inches below normal in precipitation. Rain total from Tuesday into Thursday - could range from .75 to 1.50"
Increasing Clouds, mostly cloudy by morning with chance of showers by 7am.. Winds East 5 to 10 mph. Lows near 48. TOMORROW NIGHT: Cloudy with showers. Lows near 48.
in the afternoon. Highs near 58. Overnight will be mostly cloudy. Lows near 45.
partly to mostly cloudy skies. Lows near 50. Sunny Skies. Cool. Highs 50 to 55. Overnight will be cold with clear skies. 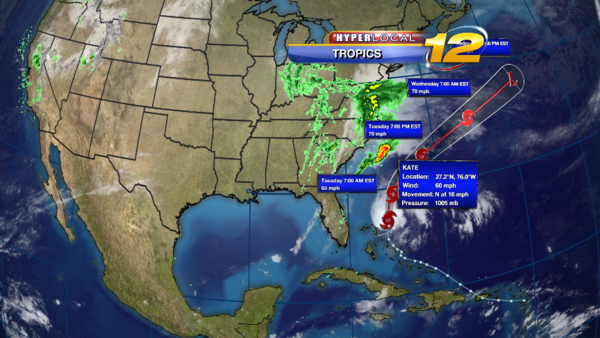 The current track will keep the storm off shore and South and East of Long Island. 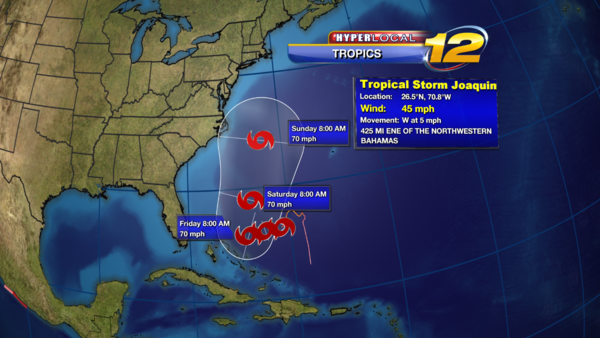 IT LOOKS LIKE THE TROPICAL STORM WILL TOP OUT NEAR 70 MPH. THERE IS A CHANCE THIS STORM BECOMES A HURRICANE. 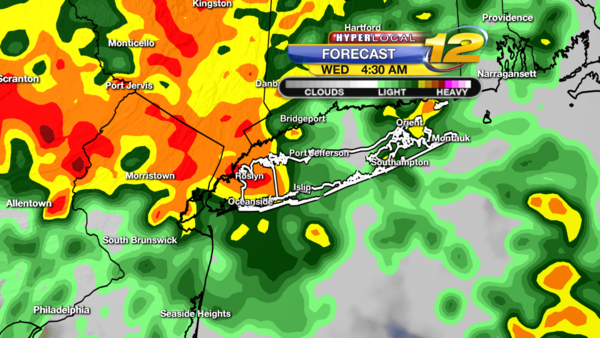 AGAIN... ON THE CURRENT TRACK NOT A THREAT TO LONG ISLAND. - Some beach erosion and large waves are possible. 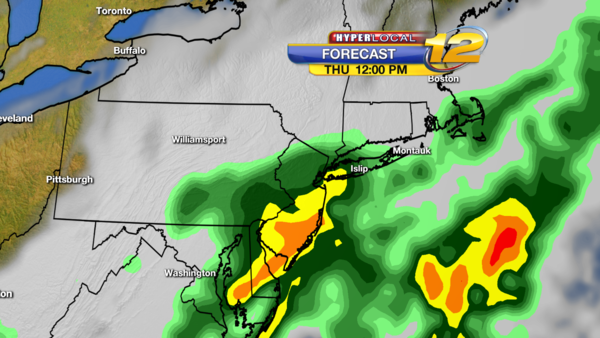 As we head through the day Tuesday we are still expecting periods of light to moderate rain throughout the day. There is still the chance for a few heavy downpours, but overall we are not expecting an excessive amount of rain Tuesday. See below for the latest total rain projections from Tuesday morning through Wednesday morning. We could certainly still use plenty of more rain than that...as Rich posted earlier Monday, we are still over eight inches below normal precipitation levels. The morning commute, outside of a stray shower, is mainly dry. 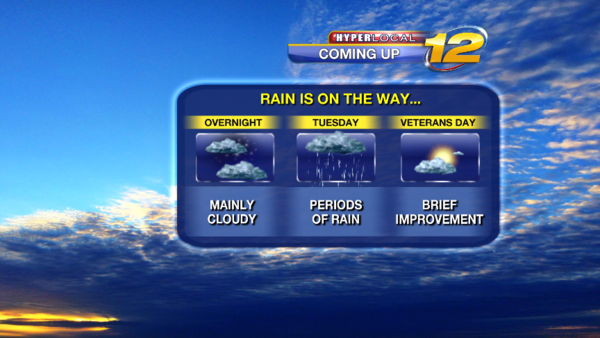 Showers linger early Wednesday morning...then some improvements for Veterans Day afternoon! 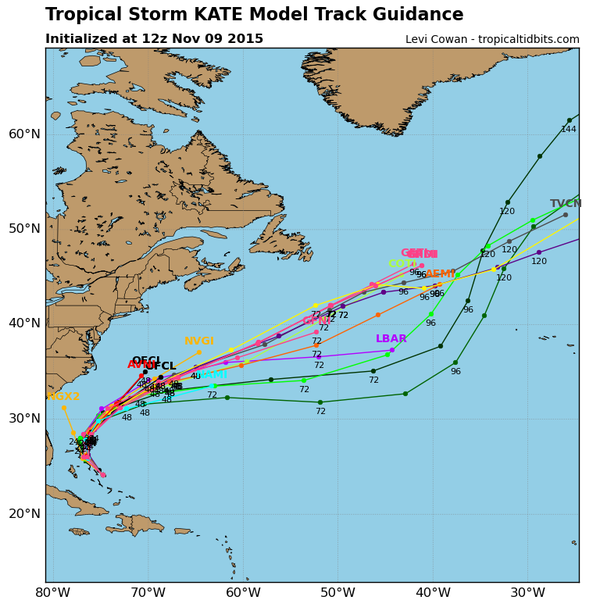 We are still watching Tropical Storm Kate in the Atlantic. This storm WILL NOT impact our weather directly, other than on the coastal waters. 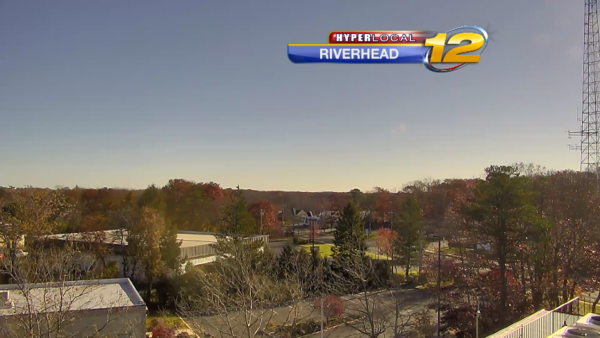 After Tuesday's rain, some breaks of sunshine develop for Veterans Day afternoon. 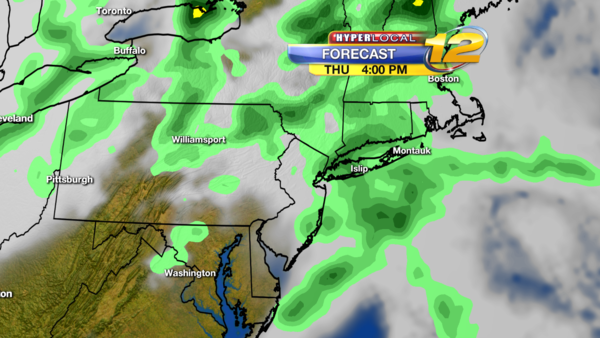 Light rain showers will then impact us again Thursday afternoon and evening. Right now, Friday through the weekend looks gorgeous with sunshine! METEOR SHOWER: The Taurid meteor shower peaks this week! Our viewing conditions won't be great until late overnight Thursday night into Friday morning and then Friday night through the weekend nights looks great. The actual meteor shower peaks Wednesday night, but we will still be able to see a few through the next few nights after that too. I actually witnessed one Sunday morning as I headed off to work. There is not a lot of these per hour, roughly 5-15, but if you see one you are likely to see an impressive fireball that lasts for a few seconds - that's the upside to waiting to try to see one of these...hope some of you can see some late in the week! TODAY: VETERANS DAY. 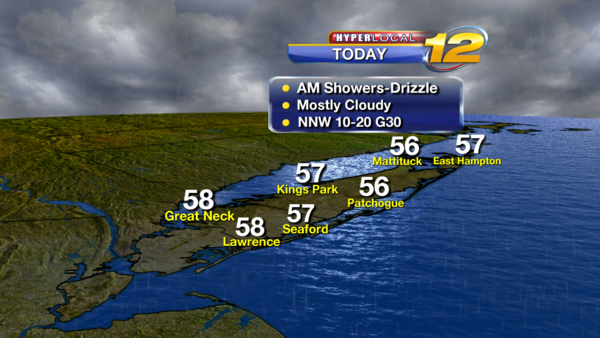 Morning clouds, showers, drizzle and fog. Some spotty showers into the afternoon over the east end. Mostly cloudy this afternoon with a few breaks of sunshine. Breezy. Winds North-Northwest 10 to 20 mph. Highs near 57. Sunset: 4:38pm. TONIGHT: Partly to Mostly Cloudy skies. Chilly. Winds North 5 to 10 mph. Lows near 42. Sunrise: 6:36am. TOMORROW: Some breaks of sunshine in the morning, otherwise mostly cloudy skies with showers developing towards noon. Winds South-Southeast 5 to 15 mph. Highs near 60. Overnight will be mostly cloudy with a chance of showers through midnight. Skies will clear towards morning. Lows near 46. FRIDAY: Mostly Sunny Skies mixed with some clouds. Windy. Winds West-Northwest 15 to 25 mph, some gusts to 35. Highs near 60. Overnight will be partly to mostly cloudy. Windy. Slight chance of a shower. Lows near 40. SATURDAY: Sun and Clouds. Windy. Winds West-Northwest 15 to 25 mph, some gusts to 30 mph. Highs 52 to 57. Overnight will be clear and cold. Lows 33 to 40. SUNDAY: Mostly Sunny and Cool. Highs 50 to 55. Overnight will be clear and cold. Lows 32 to 40. MONDAY: Mostly Sunny. Highs 55 to 60. Overnight will be partly cloudy. Lows 40 to 45. Watch the gauges - You can see when the water reaches Flood Stage. TODAY: Coastal Flood Advisory. Tides 1 to 2 feet above normal during high tide. Check weather extra for more details. Cloudy Skies with some drizzle and fog this morning. 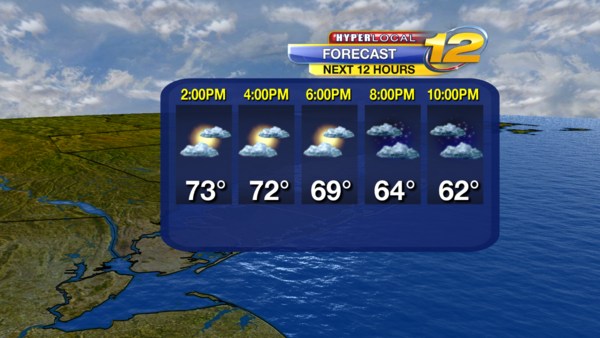 Cloudy skies with scattered showers this afternoon. Breezy. 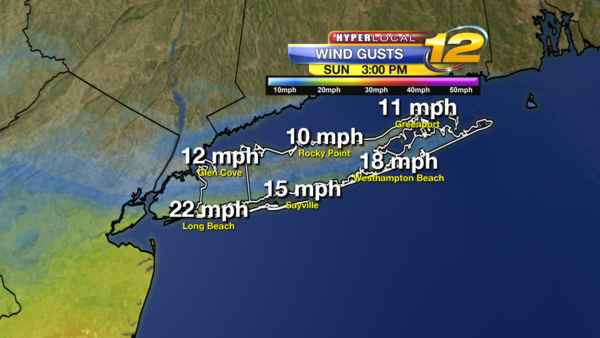 Winds South/Southeast 5 to 15 mph with some gusts 25 to 30 this afternoon. Highs near 60. Sunset: 4:37pm. TONIGHT: Cloudy with chance of showers through 7pm. Clearing skies and breezy. Winds West 10 to 20 gusts to 30 mph. Lows near 47. TOMORROW: Mostly sunny with a few clouds. Windy and Cooler. Winds West 15 to 25 with gusts to 40 mph. High near 56. TOMORROW NIGHT: Partly to mostly cloudy. Slight chance of a shower. Lows 40 to 45. SATURDAY: Mostly Sunny with a few clouds. Chilly. Windy. Winds West-Northwest 15 to 25 with some gusts to 35 mph. Highs 47 to 52. SATURDAY NIGHT: Clear and cold. Lows 32 to 38. SUNDAY: Mostly Sunny. Dry. Highs 50 to 55. SUNDAY NIGHT: Clear and cold. Lows 32 to 40. MONDAY: Mostly Sunny. Mild. Highs Near 60. Normal Average is 54. MONDAY NIGHT: Partly cloudy. Lows near 45. TUESDAY: Mostly Sunny. Highs 57 to 62. TUESDAY NIGHT: Partly cloudy. Lows near 48. WEDNESDAY: Partly Sunny. Mild. Highs 58 to 63. WEDNESDAY NIGHT: Mostly cloudy with lows near 49. ON THIS DATE IN U.S. WEATHER HISTORY: in 1989, a severe weather outbreak east of the Mississippi River resulted in around 500 reports of severe weather damage. This includes several tornadoes in nearby New Jersey. The wind that was around the past couple of days has now greatly diminished. That being said, it was a freezing cold start to the day across parts of Long Island - just look at this morning's low temperatures below - BRRRRRR!! By this afternoon, you'll just need a lighter jacket at most. We're looking at a warmer afternoon than yesterday by around 5-8 degrees or so. 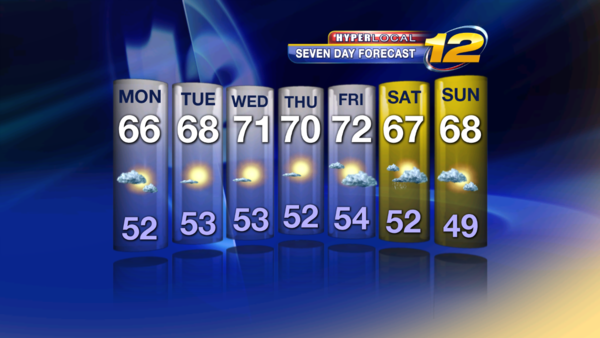 We start the seven day forecast with great weather today through Tuesday. Then, clouds build on Wednesday. That's ahead of our next rain chance which should provide us with some much needed moderate rain throughout the day on Thursday. 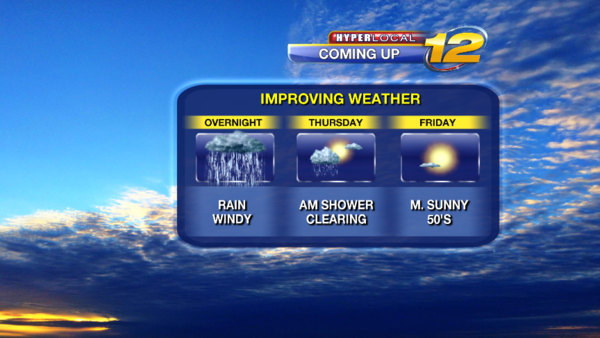 A few showers will linger into early Friday morning, then drying out by Friday afternoon. Have a great day and a great start to the week! Forecast update by METEOROLOGIST RICH HOFFMAN MONDAY NOVEMBER 16TH 2015 AT 630AM. TODAY: Lots of Sunshine. Light winds Northwest 5 to 10 mph. Highs near 62. Sunset: 4:34pm. Record High is 70 set in 2001. TONIGHT: Clear skies, light winds and it will be cold. Winds North-Northeast 5 to 10 mph. Lows near 36. Sunrise: 6:42am. TOMORROW: Mostly sunny and chilly. Winds North-Northeast 5 to 10 mph. Highs near 50. TOMORROW NIGHT: Clear and cold. Lows 32 to 40. WEDNESDAY: Morning sunshine giving way to afternoon clouds. 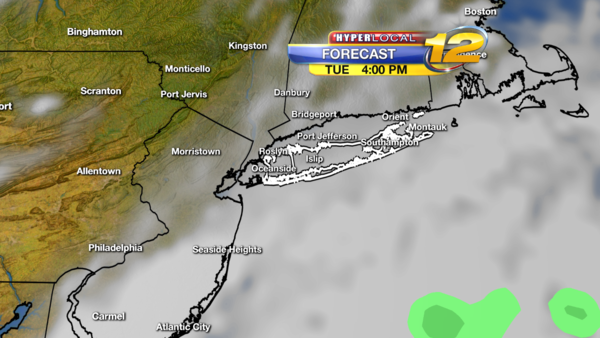 Some patchy fog and drizzle towards evening. Highs near 62. 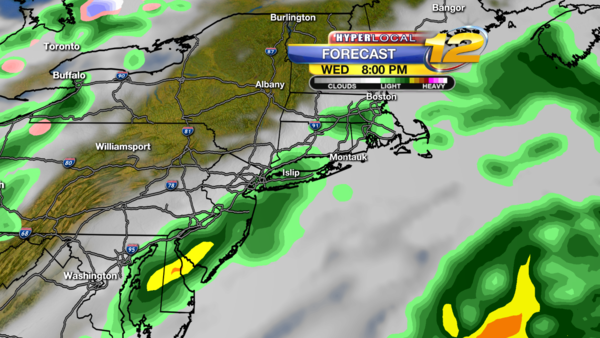 WEDNESDAY NIGHT: Cloudy with some drizzle, fog and a few spotty showers. Lows near 49. THURSDAY: Cloudy skies. Periods of rain. Windy - South winds 15 to 25 mph with gusts to 30 mph. Some thunderstorms possible. Highs 60 to 65. 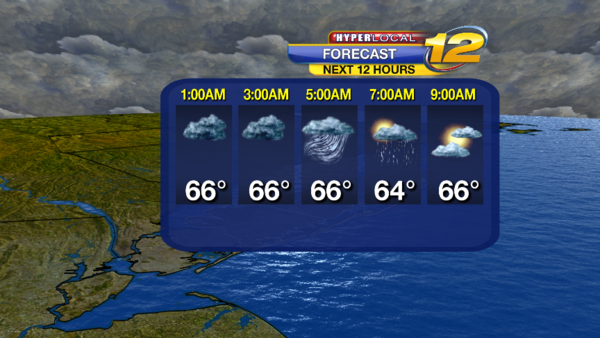 Overnight will be cloudy, scattered showers and drizzle. Breezy. Thunderstorms possible. Rain Storm totals .75 to 1.50 inches. Lows near 50. 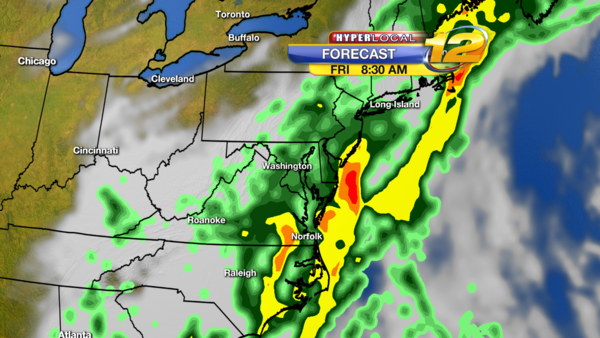 FRIDAY: Morning showers gives way to improving weather and some sunshine towards late afternoon. Breezy. Highs 55 to 60. Overnight will be partly cloudy with lows 37 to 42. SATURDAY: Sun and Clouds. Highs 50 to 55. Overnight will have clear skies. Lows 37 to 42. SUNDAY: Mostly Sunny. Highs 50 to 55. Normal Average High is 51. Sunset: 6:47pm. Overnight will be partly cloudy. Lows near 42. We have clouds and rain on the way for late Wednesday and Thursday but for tonight skies will be mostly clear and that means we will get a chance to see some shooting stars. The annual Leonid Meteor Shower peaks tonight, and while it may not be as spectacular as in some prior years, it is still worth taking a peek at the sky. The below maps will show you what will happen through Thanksgiving if you have travel plans or any outdoor plans. When you look at the maps - Red L means low pressure - You can usually find precipitation with low pressure - IE Rain or Snow. Blue H represents High Pressure and usually has stable dry sunny weather conditions. TODAY: Cloudy skies. 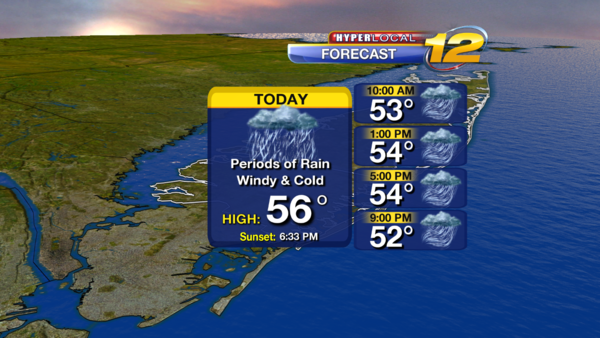 Periods of rain this afternoon into this evening. A few thunderstorms possible. Some will be heavy at times. Gusty winds. Winds South-Southeast 15 to 25, some gusts to 35 mph. Highs near 63. Record High is 63 set in 1999. Normal Average High is 53. TONIGHT: Cloudy skies. Periods of rain. Some thunderstorms possible. Some rain will be heavy at times. Winds South/Southeast Shifting to the West 10 to 20 mph with gusts to 25. Lows near 52. Normal Average low is 35. 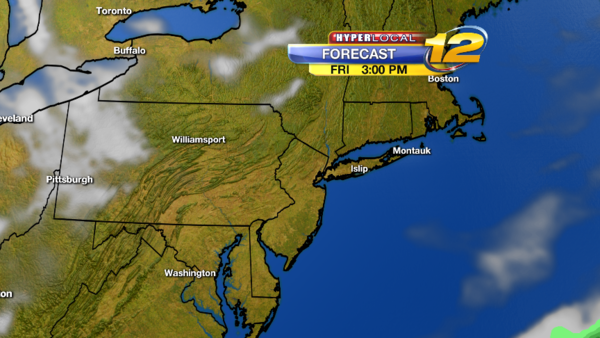 FRIDAY FORECAST - Some morning clouds, otherwise mostly sunny skies. Breezy. Winds West-Northwest 10 to 20 mph. Highs near 55. Overnight will be partly cloudy. Colder. Lows 32 to 40. SATURDAY: Sun and Clouds. A little Chilly. Highs near 50. Overnight will be mostly cloudy. Chance of showers. Low near 41. 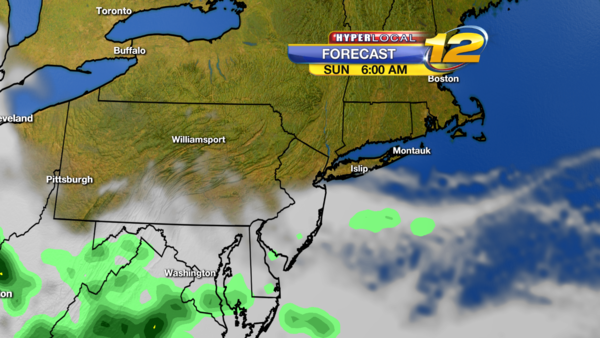 Below is the weather map for Sunday and you can see some showers in the morning from a low pressure system. 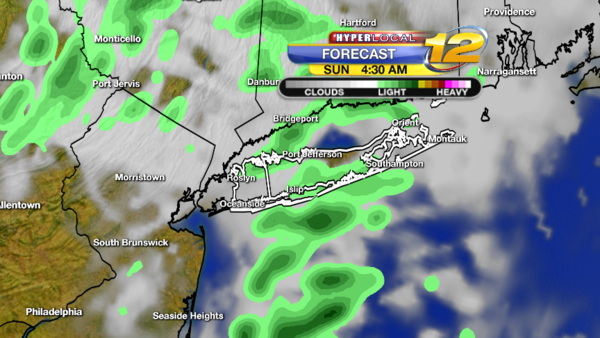 SUNDAY: Some morning clouds and a few showers. Partly Sunny for the afternoon. Breezy. Highs near 54. Overnight will be clear and turning colder. Lows near 32. 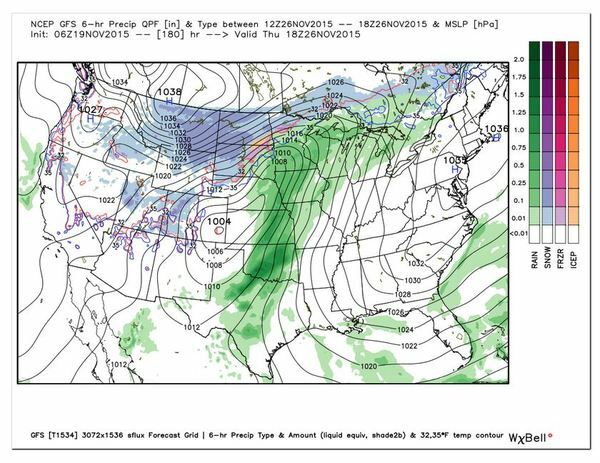 MONDAY WEATHER MAP BELOW - Shows high pressure to the west (blue H) will keep us dry but it will be cold. MONDAY: Cold in the morning with lows in the 20s and 30s. Mostly Sunny and a little cold. Highs near 44. Overnight will be clear and cold. Lows 27 to 32. 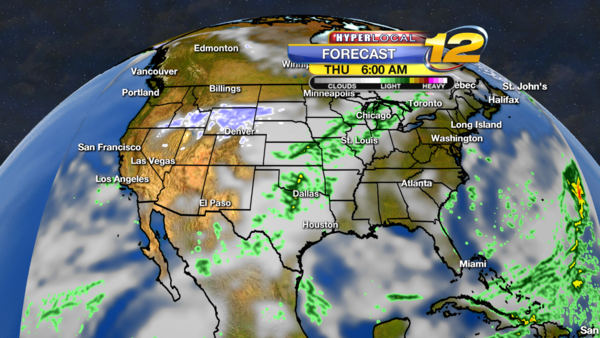 TUESDAY WEATHER MAP BELOW: TUESDAY: Mostly Sunny with highs near 50. Overnight will be clear and cold. Lows 30 to 35. You can see some stormy weather with snow in the Rockies and West Coast - Rainy weather developing in the plains. 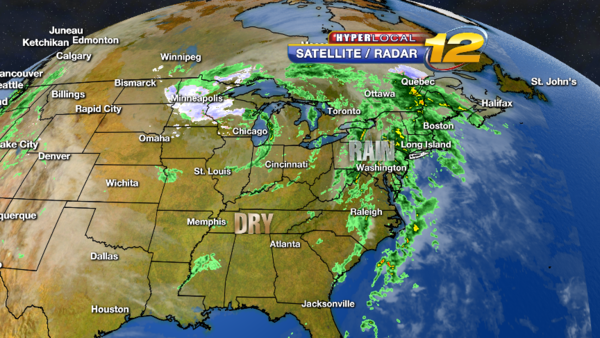 Most of the East Coast will be dry. Some showers in Florida. Wednesday high temperatures in map below. 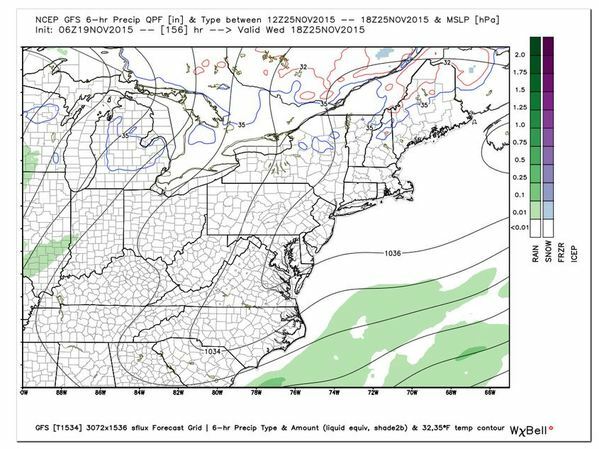 THANKSGIVING THURSDAY NOVEMBER 26TH WEATHER MAPS BELOW - Dry weather over Long Island and the Tri-State area will keep us dry and sunny. 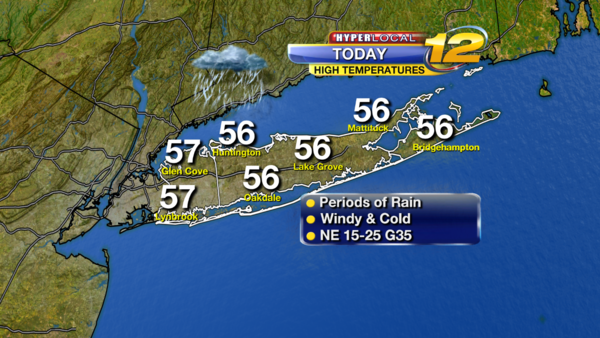 Highs for Thanksgiving 53 to 58 degrees. On Thanksgiving a storm will develop over the Northern plains with heavy snow and strong winds in Montana, North and South Dakota(areas of Blue). Rain with gusty winds and possible severe weather from Texas to Minnesota(Area of Green). Very cold Weather to the North with very warm weather along the Gulf Coast. High Temperature Map for Thanksgiving. As we go through this weekend before Thanksgiving, we're noticing sunshine today that will mix with some clouds, especially towards this evening. It's going to be a bit chillier than yesterday with highs close to 50. 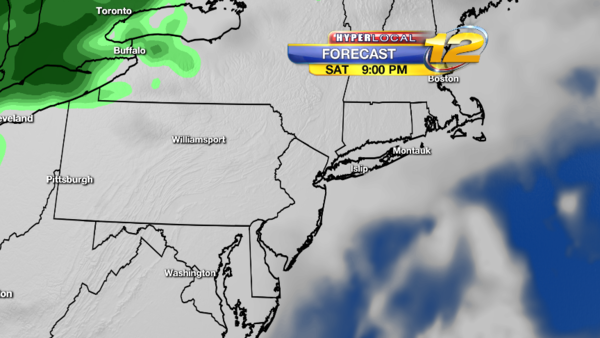 By tonight, we watch the chance for a few showers, well after midnight. Otherwise mainly cloudy and chilly. 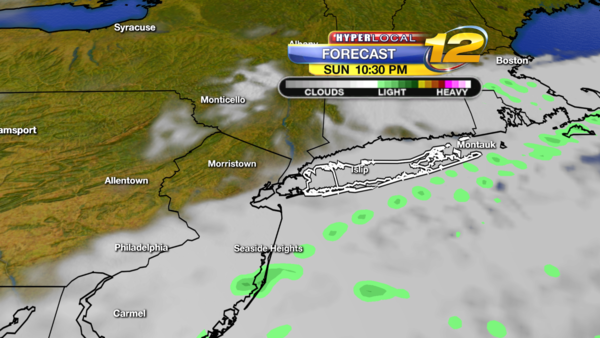 You can see on the futurecast - a few showers will be over Long Island starting between 2am and 4am Sunday. By mid-morning, those showers are long gone! 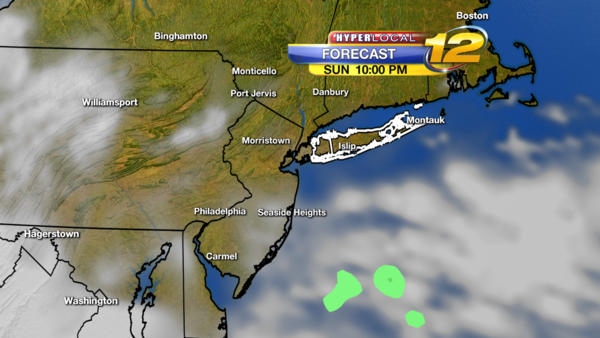 For the rest of Sunday we'll see clouds associated with a nearby offshore storm and some breaks of sunshine possible. Take a look at the map below. You can see a big storm blanketing some states like Illinois, Michigan and Indiana with snow on the north and west sides of the storm and some rain on the southeast side of the storm. 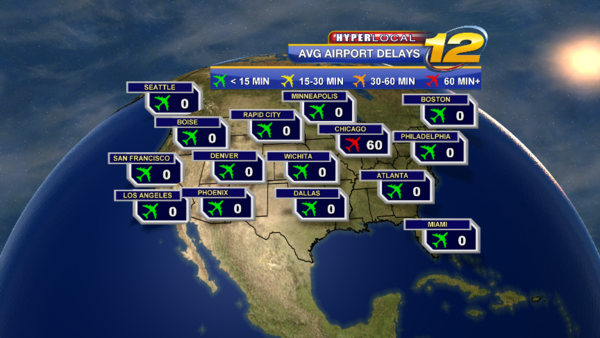 If you are traveling near any of these areas especially, please check with your air carriers! Outside of that and closer to home, we are going to overall see a really nice stretch of weather through the Thanksgiving holiday. 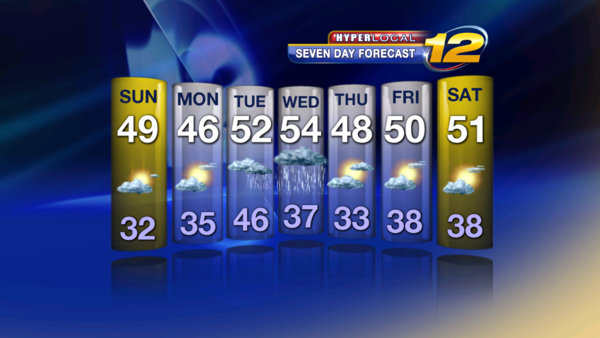 After a few early morning showers on Sunday, it will be colder for Monday. However, we rebound through the 50's throughout the rest of the week with mainly sunny skies right through Thanksgiving Day and Black Friday. Overall, we are looking at changes to today's forecast from yesterday. The coastal storm developing offshore looks like it will be JUST close enough to provide us with some showers and some steadier rain towards the twin forks. So, keep an umbrella or a rain jacket with you today. The dry start after some overnight rain showers will be giving way to more showers by this afternoon. 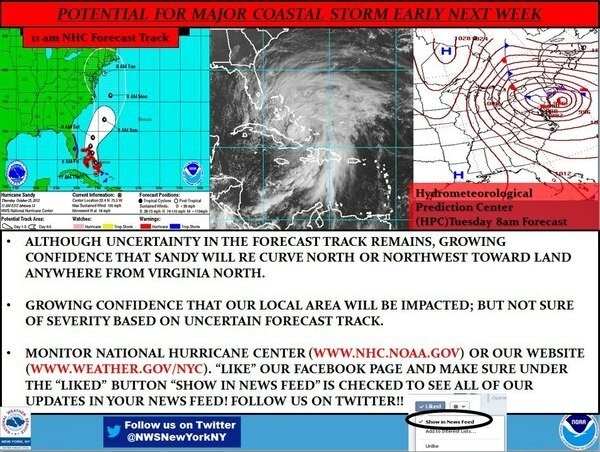 You can get a better idea of what's happening by taking a look at the futurecast slideshow below. Just hit the arrow to the right to advance to the next image. The "green" is the rain associated with that nearby, mainly offshore system. Notice the axis of steadier rain will be towards the East end through this evening. There very well may be additional dry periods this afternoon across the Western end of the island. In addition to the light to moderate rain and showers that will be arriving across most of LI this afternoon, take a look at these northeast temperatures below. That colder air is on the way for later tonight into tomorrow. We won't see teens and 20's, but at times it will FEEL like the 20's! Temperatures through the rest of today will become chillier this afternoon. Our "daytime highs" occurred early this morning. Overnight - bundle up as we head towards the lower 30's! After our rain chances today, as you can see below, we have a gorgeous looking stretch of weather coming up for Thanksgiving week. It will feel cold tomorrow; however, with wind chills in the upper 20's and 30's. Air temperatures Monday afternoon will only top off in the low 40's. High temps rebound through the mid 50's through Thanksgiving Day with mostly sunny skies until our next chance for showers next Saturday. Have a great day and stay dry! 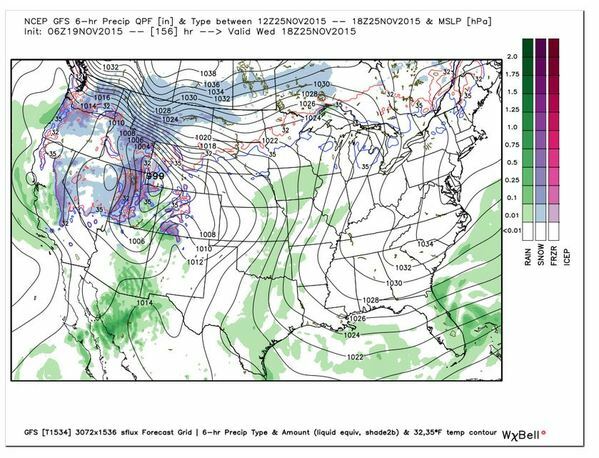 Forecast update by Meteorologist Rich Hoffman 1pm Monday November 23rd. Mostly Dry conditions along the East Coast for Travel weather on Wednesday - See the travel Maps below. 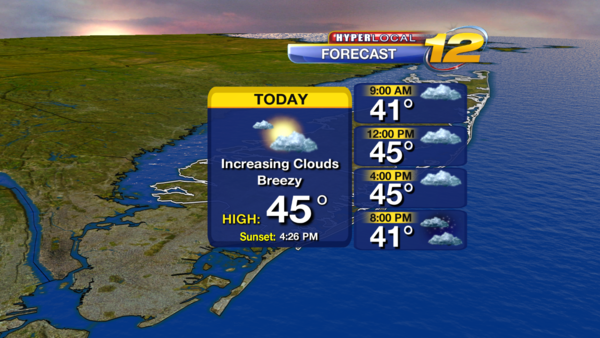 TODAY: Sunny Skies and it will be windy and cold. Winds West-Northwest 10 to 20 mph with gusts to 30. Highs near 43. Sunset: 4:29pm. Normal Average High is 51. TONIGHT: Clear and Very Cold. Winds West-Northwest 5 to 10 mph. Lows near 27. TOMORROW: Mostly sunny. Chilly. Winds West 5 to 10 mph. Highs near 46 degrees. Overnight will be clear and cold. Lows near 32, 20s around the Pine Barrens. WEDNESDAY: Mostly Sunny, a little warmer. Highs near 50. Overnight will be partly cloudy with lows near 40. THURSDAY: HAPPY THANKSGIVING. Mostly Sunny to a mix of sun and clouds. Warm. Highs 55 to 60. Overnight will be partly cloudy. Lows near 45. FRIDAY: Sun and Clouds. Warm. Highs 57 to 62. Overnight will be partly cloudy. Lows near 48. 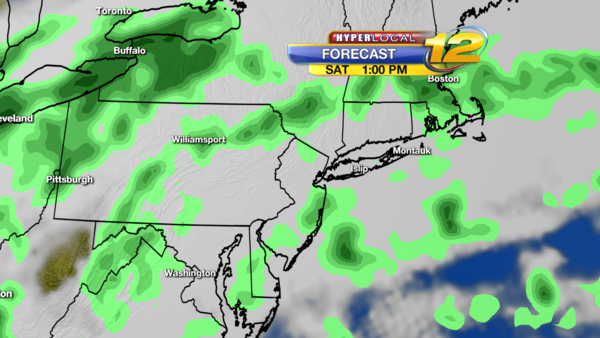 SATURDAY: Mostly Cloudy skies with a few showers. Highs 55 to 60. Overnight will be mostly cloudy with a few showers. Lows near 38. SUNDAY: Partly Sunny and a little chilly. Highs near 48. Overnight will be partly cloudy. Lows near 36. 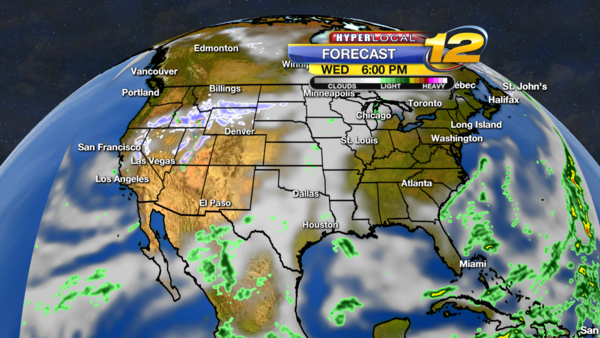 Generally nice weather from New England down the coast to the Gulf of Mexico. Even though high pressure will control our weather, winds from the southeast off the ocean will make Long Island mostly cloudy. But it will be mild, with highs in mid 50s. Isolated showers and very breezy but otherwise OK in Florida. Denver with temperatures in the 20s. The west coast looks good. 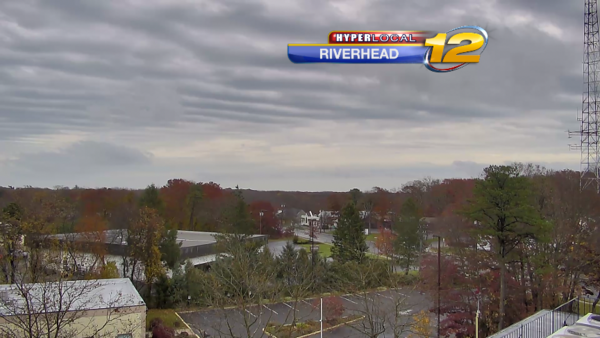 A mostly cloudy start to our Sunday...This was Riverhead just before 10AM. 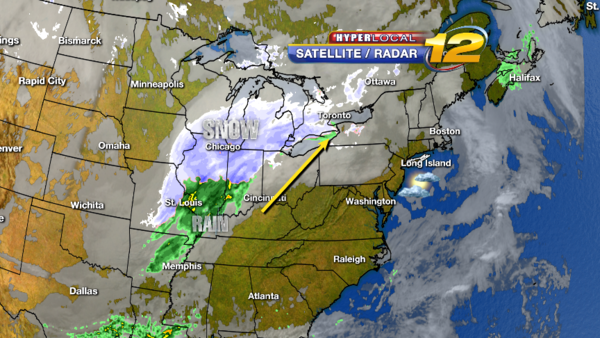 As you can see on the East Coast map below - showers are now to our southeast and they continue to head that way. 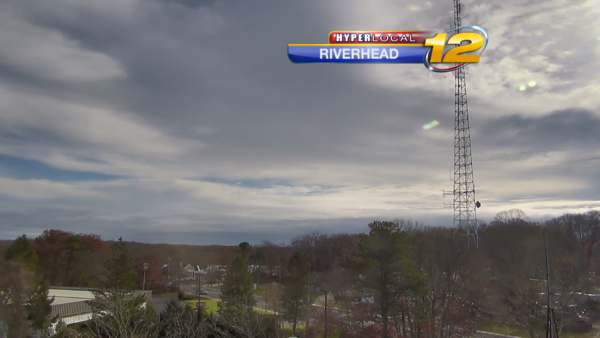 The clouds are clearing as well, giving us a nice looking end to our weekend! However, as you see above, it is a chilly end to the weekend. 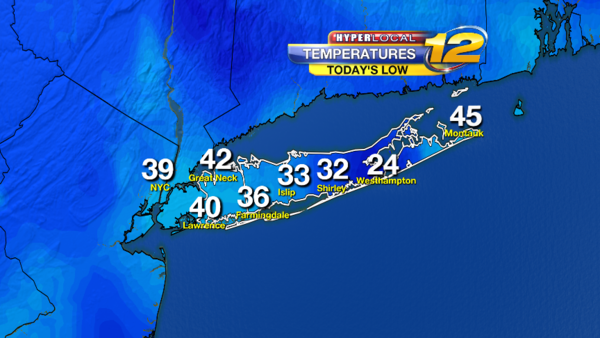 Across Long Island this morning we slowly climb through the 40's, colder just to our northwest. 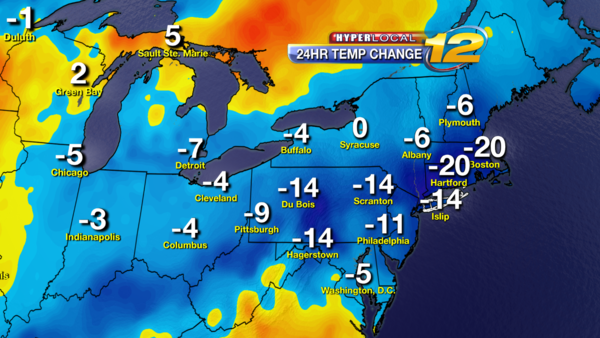 The map below shows the difference in temperature already compared to this time yesterday. We'll be topping off with much cooler temps this afternoon than those 60's like we saw the past couple of days. So, a mix of sun and clouds for the rest of today. 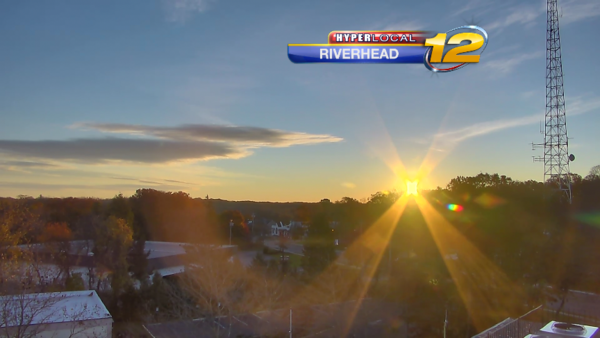 More sunshine than clouds this afternoon! Highs near 49. Cold tonight under mostly clear skies. Monday will be CHILLY! Only in the mid-40's Monday afternoon. 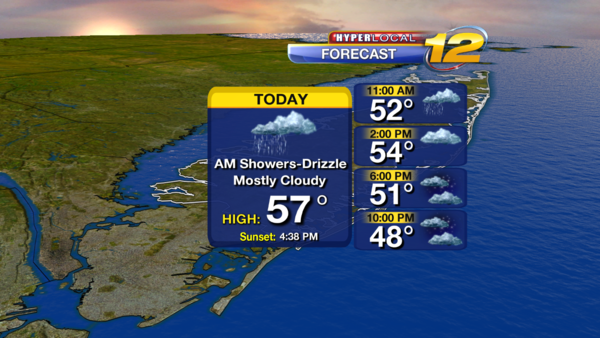 Cloudy skies for Tuesday with some light rain and drizzle developing. 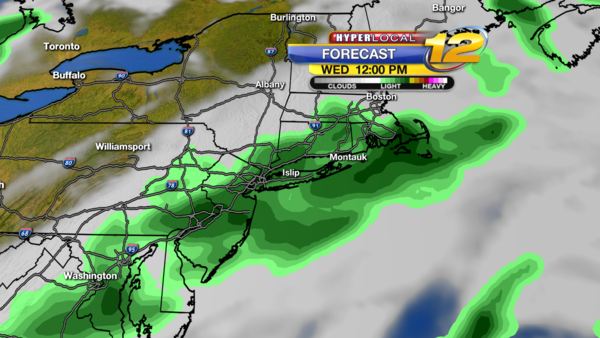 On and off steadier showers are still likely for Wednesday before we dry things out for the end of the week. TONIGHT: Mostly Cloudy skies. Chance of showers or drizzle towards morning. Winds East 5 to 10 mph. Lows near 42. Normal Average low is 32. Sunrise: 4:26am. TUESDAY: METEOROLOGICAL WINTER STARTS (Dec-Jan-Feb). Cloudy skies with scattered showers developing. Best threat of rain will be in the afternoon. Breezy at times. Winds East 10 to 15 mph. Highs near 52. TUESDAY NIGHT: Cloudy with showers. Lows near 48. 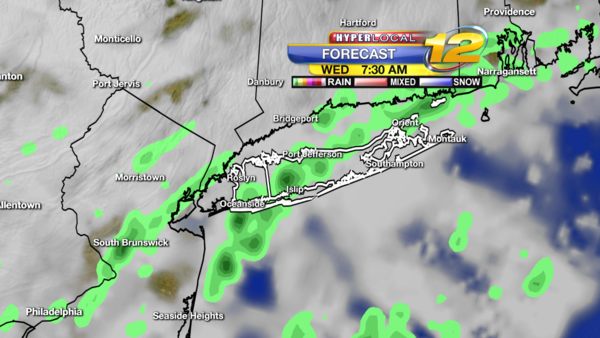 WEDNESDAY: Cloudy skies, periods of rain. Mild and Breezy. Highs near 57. 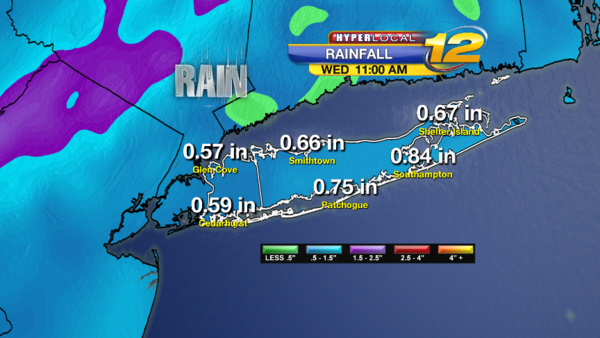 Storm rain totals .75' to 1.50"
WEDNESDAY NIGHT: Clouds and showers ending, skies becoming partly cloudy towards morning. Lows near 39. THURSDAY: Mostly Sunny. Breezy at times. Highs near 50. THURSDAY NIGHT: Mostly clear with lows near 35. FRIDAY: Sun and Clouds. Highs 47 to 52. FRIDAY NIGHT: Partly cloudy. Lows near 37. SATURDAY: Mostly Sunny. Highs 47 to 52. SATURDAY NIGHT: Clear and cold. Lows 32 to 37. SUNDAY: Mostly Sunny with highs in the low 50s. SUNDAY NIGHT: Partly cloudy. Lows near 38. 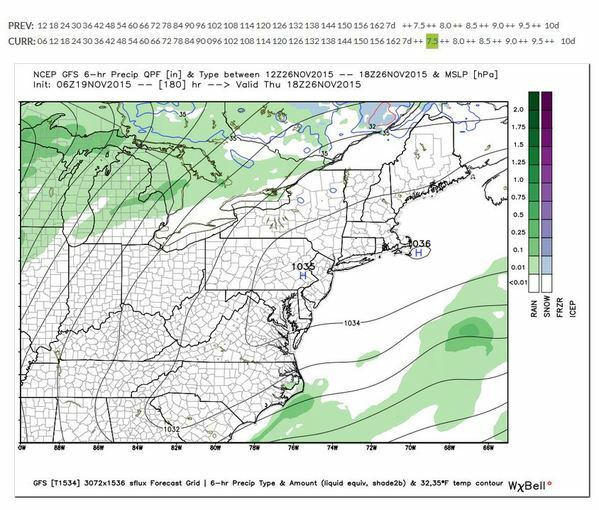 Update by Meteorologist Rich Hoffman Monday 8pm December 7th 2015. A little winter update.. But wait - it is NOT winter Yet. We are still in late fall and our Normal High is 46 and Normal low is 30 degrees. Let's go back before we go forward about this up coming Winter. After looking at my social media page it appears that 60% dislike cold and snow and 40% love cold and snow. Our Climate shows we get snow on Long Island and for the most part more than 2 feet of Snow. Our record lows go as cold as 23 degree below zero. So each winter, we need to be prepared for Cold and Snow. 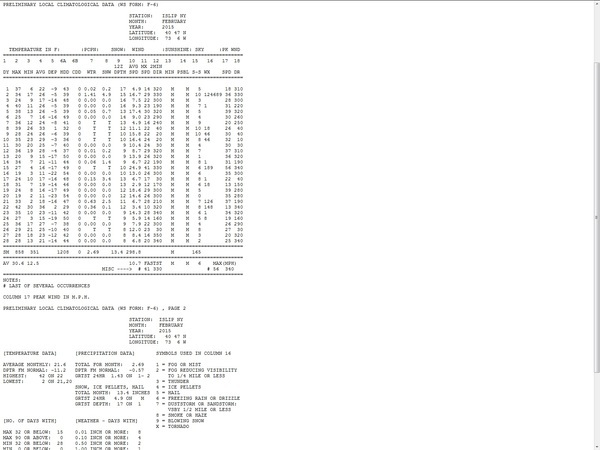 Our highest snowfall in a season 1995-96 90.8 inches. 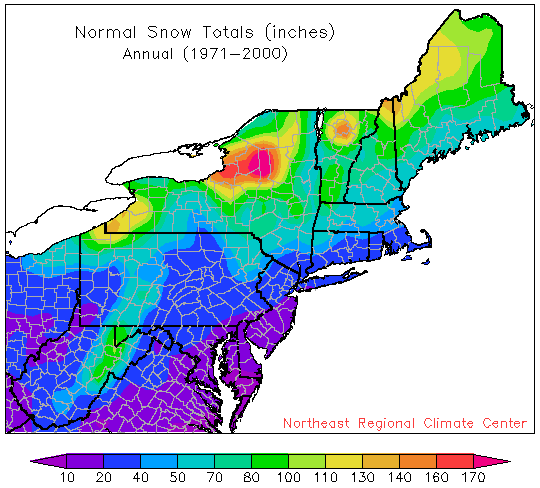 Least amount of snow was the winter of 1997/98 4.5" . The Huge question is How Much Snow for this winter? 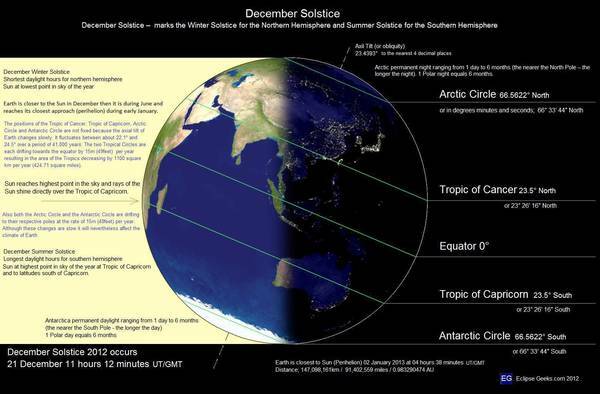 Winter 2015/2016 -- December 21st 11:48pm E.S.T to March 20th 6:44pm E.D.T So just to remind everyone we have not started winter yet..
Winter in the Northern Hemisphere Starts when the sun's direct rays hit 23 1/2 degrees south at the Tropic of Capricorn. This is also when we get the shortest daylight. 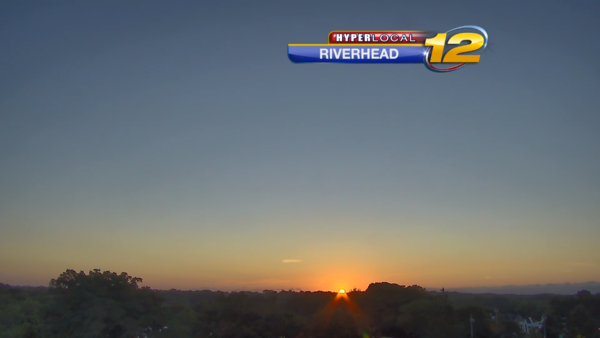 For Long Island, Sunrise: 7:13am, Sunset: 4:29pm. On March 20th Sunrise: 6:56am, Sunset: 7:05pm. You can see the difference in daylight, more daylight will lead to warmer temperatures. 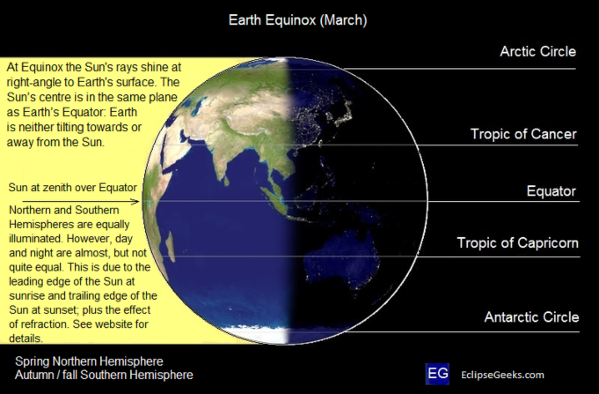 The Sun's Directs rays move back to the north and on March 20th hits the Equator. So for us, here on Long Island and the Northeast, our coldest time is January and February. 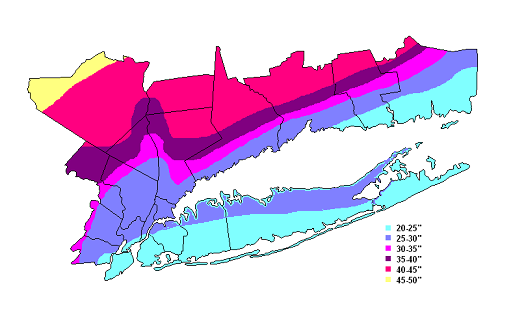 Most of Long Island averages 22 to 32 inches each winter. 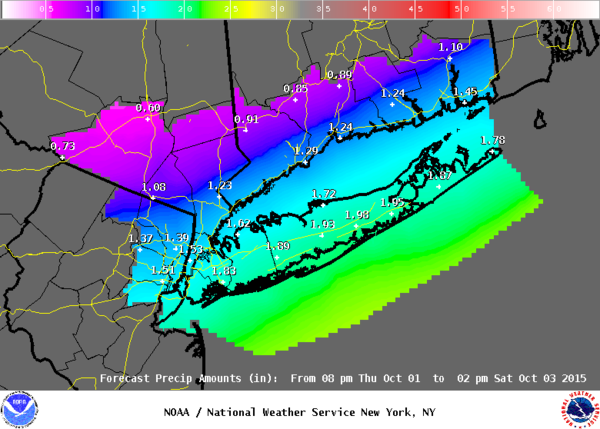 -- Click this link - http://www.erh.noaa.gov/okx/SnowClimo/SnowClimoMain1.html for totals around Long Island. Our Heaviest Snow typical fall from January 17th to March 17th. Take a look at our average snowfall map for Long Island and the Northeast in the maps below. Here is a link to snowfall totals for Brookhaven National Lab going back to 1947. 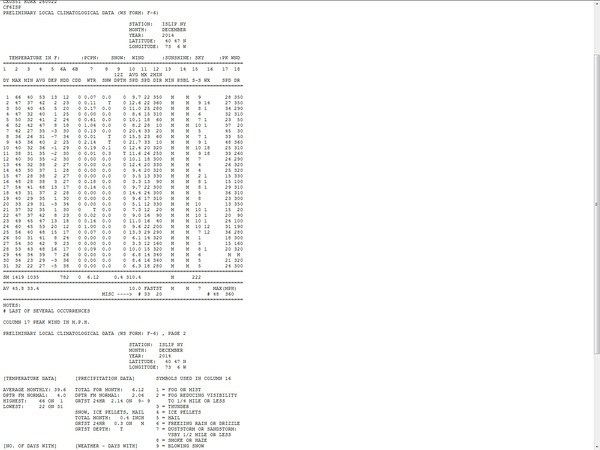 Here is the seasonal Snowfall totals at Islip Since 1983. 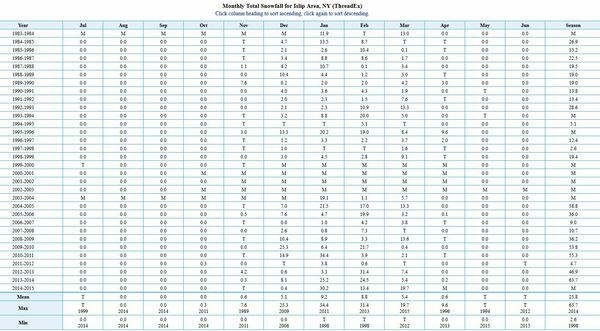 Here is a link to Islip Almanac Data - http://www.weather.gov/okx/IslipHistorical it shows that in the Heart of Winter our Normal Average High is 38 with a low of 23. Cold enough for snow. So now that I confirmed it gets Cold and Snows on Long Island - Every Winter you need to prepare for snow. I asked People on my Facebook page how was last winter - almost 100 percent said cold and snowy. But Did you know December was 4 degrees above normal and it was 60 Degrees on Christmas Eve. It was 56 degrees on Christmas Day. We had a huge weather pattern change in January and it turned cold and stormy which lead to a lot of snow. I am not saying it will be as cold and snowy as last winter but be prepared for colder weather and snow in the New Year. Let's look at December 2014 weather - Look at the warm temperatures. Almost like this year. 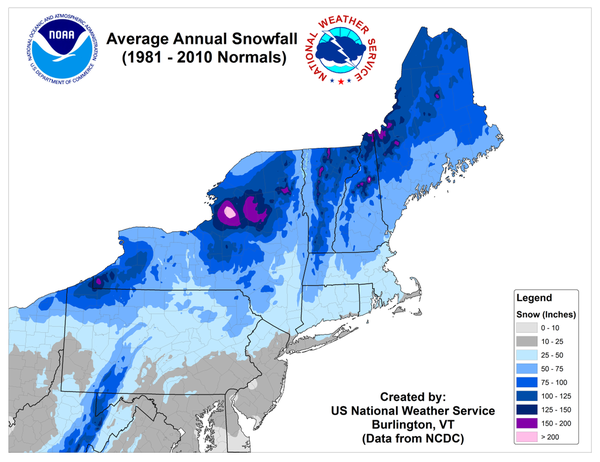 The below image Shows the cold and snowy weather of January 2015. We had a 12 to 30 inches snowstorm on the 26th into 27th. Temperatures for the month ended 1.9 degrees below normal. Extremely Cold weather in February 2015, see image below. For the month we had 13.4 inches of snow. It was very cold. Many days with highs in the 20s and lows in the single digits. Temperatures for the month averaged 11.2 degrees below normal. El-Nino is the warming of the Pacific Ocean and it can impact the weather patterns in the United States - Long Island is thousands of miles a way from the warm ocean source that one little shift and we can get a major Nor'easter and heavy snow. As of the End of November El-Nino was in a very strong warm phase - hence why the East Coast as been warm. El-Nino is forecast to weaken in 2016 ,which would lead to a change in the weather pattern. That is when we can get our cold and snow. Does this big shift happen in January or Late February? The later it happens the less cold and snow. As of now, I see that happening towards Mid January - I see some storms around 17th to 25th, February 4 to 10th and February 22 to 28th. I see some very cold weather but not prolonged as last year. From December to March, I think our temperatures will be Near Normal to above normal and Snowfall Near Normal or Below. I would plan for 15 to 25 inches. The problem is, one Nor'easter can drop 10 to 20 inches and mess up the seasonal snow forecast. What about a White Christmas? The Last one we had was 2013. We had 1.7" of snow December 24th 2013. On the ground at 7am December 25th 2013 we had 1" of snow on the ground and that qualifies for a white Christmas. 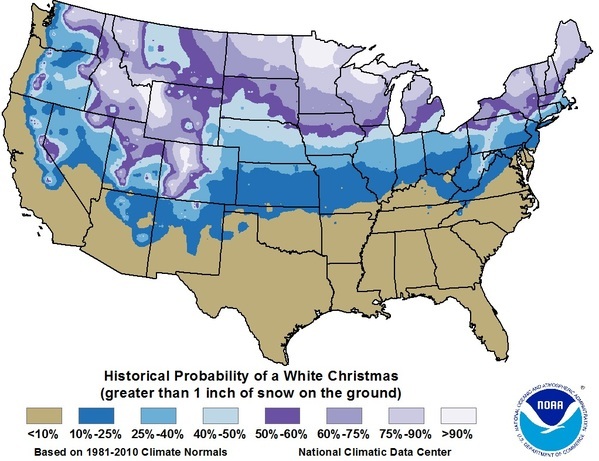 We have about a 20 to 25% chance of a white Christmas. Unless we see a big pattern change by Christmas - It is not looking good for this year. 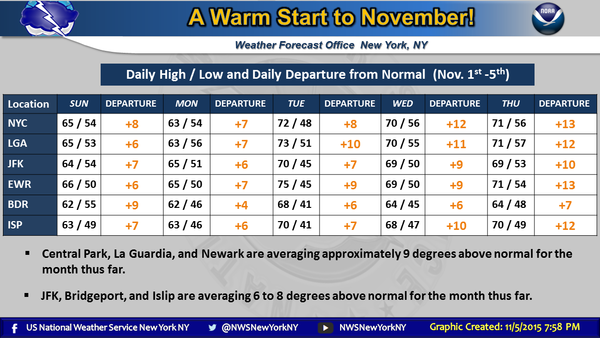 The very warm weather trend will continue through Monday and it looks like temperatures will stay above normal through December 16th. 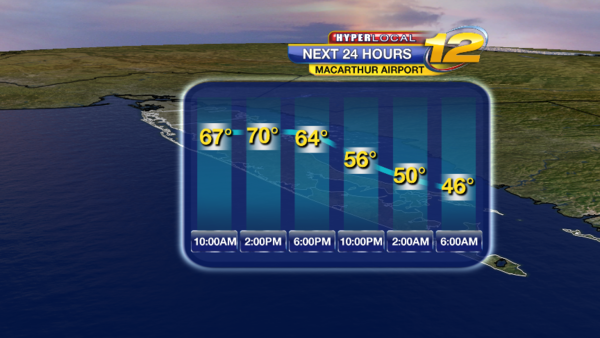 The weather will be so warm that we could have record high temperatures the next 5 days at Long island islip MacArthur airport. Tomorrow I will talk about storms and a weather pattern change from December 18th through December 26th, with a little Christmas Magic or Dreaming, we could have a white Christmas. Last White Christmas December 25th 2013, One inch of snow on the ground. THIS AFTERNOON: Sun and Clouds and Warm. Winds South-Southwest 5 to 10 mph. Highs near 58. 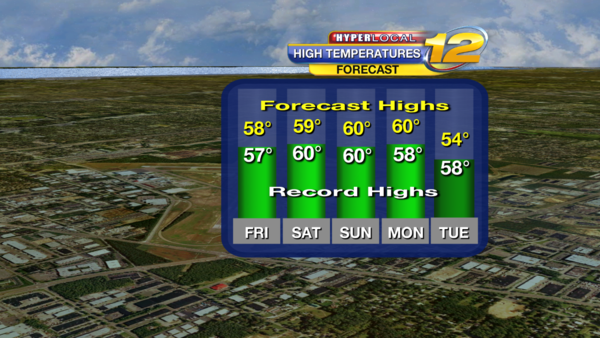 Record High 58 set in 2012. Sunset: 4:25pm. Normal Average High is 45. TONIGHT: Mostly Cloudy. Chance of a shower or drizzle towards morning. 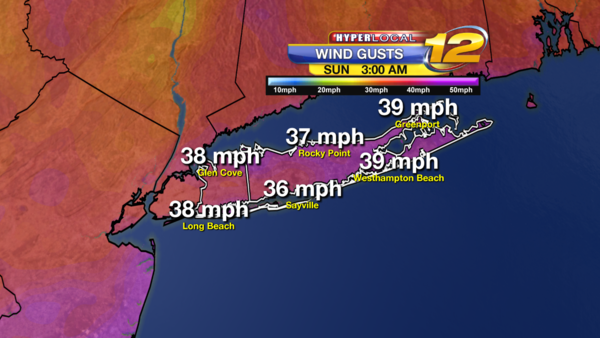 Winds South/Southwest to Westerly 5 to 10 mph. Lows near 45. Normal Average Low is 29. Sunrise: 7:07am. TOMORROW: Morning clouds, chance of shower or drizzle. Winds Southwest 5 to 10 mph. 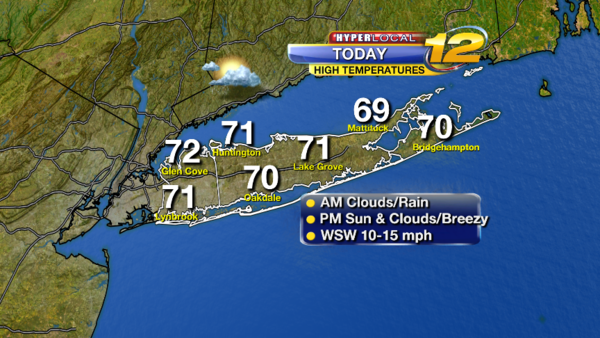 Sun and Clouds and warm for the afternoon. Highs near 58. Record High is 57 set in 2006. TOMORROW NIGHT: Partly cloudy with lows near 45. SATURDAY: Sun and Clouds. Warm. Highs near 59. 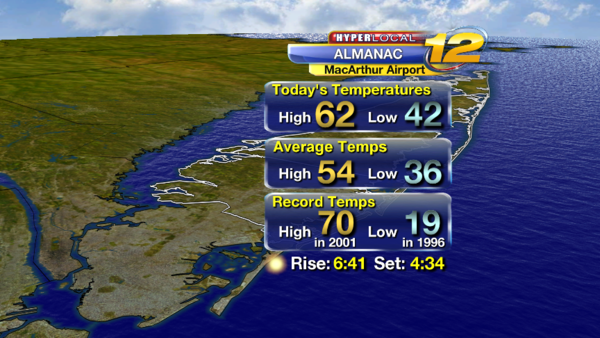 Record High is 60 set in 2008. SATURDAY NIGHT: Mostly cloudy. Patchy Fog. Lows near 46. SUNDAY: Partly Sunny to Mostly Cloudy skies. Warm. Highs near 60. Record High is 60 set in 2008. 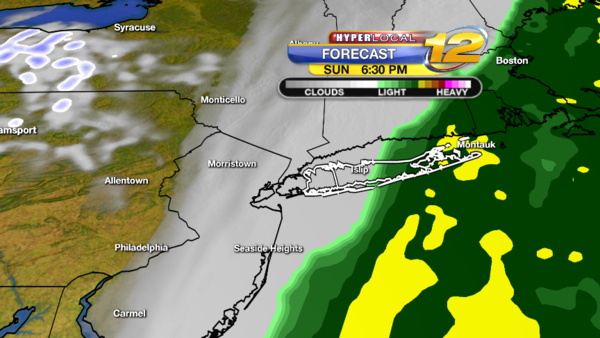 SUNDAY NIGHT: Mostly cloudy with some showers towards morning. Lows near 48. MONDAY: Mostly Cloudy and Warm. Scattered showers. Thunderstorms possible. Highs near 60. Record High is 58 set in 2001. MONDAY NIGHT: Cloudy with some showers and thunderstorm possible. Clearing skies towards morning. Lows near 44. TUESDAY: Mostly Sunny Skies. Mild. Highs near 54. Normal High is 44. TUESDAY NIGHT: Partly cloudy. Lows near 39. Normal Average low is 28. WEDNESDAY: Sun and Clouds. Highs near 54. Normal High is 44, Normal low 27.